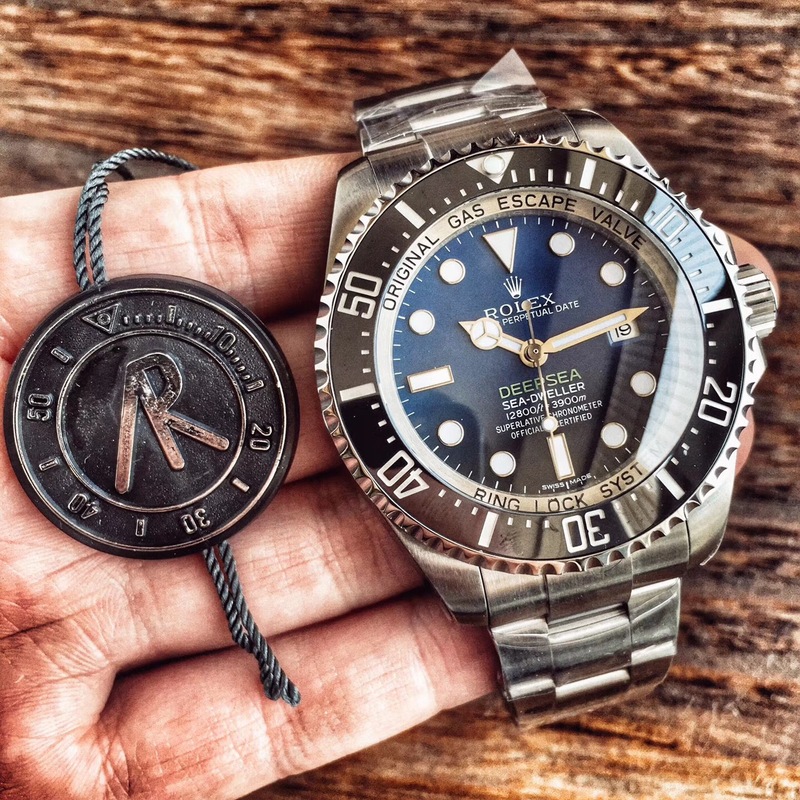 YachtMaster is a Rolex watch for special usage. 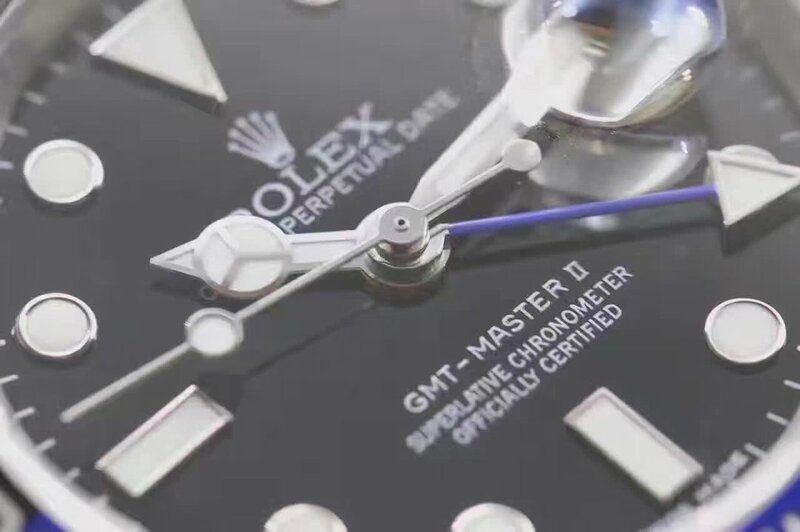 Every year, Rolex published new models for YachtMaster product line in Basel, now it has become a popular watch in the daily life of a lot watch fans. 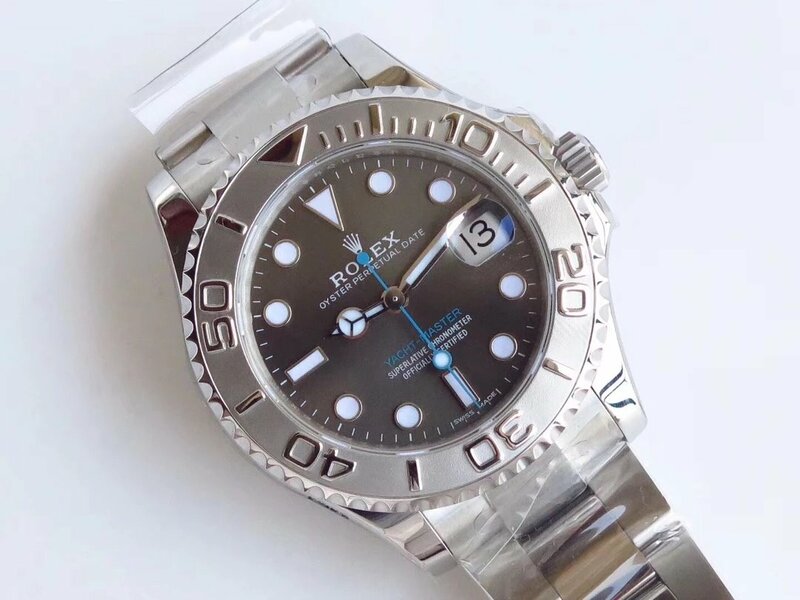 Among all YachtMaster watches Rolex has released, the YachtMaster II 116680 is the favorite watch of many watch collectors because of its blue color on bezel and dial. 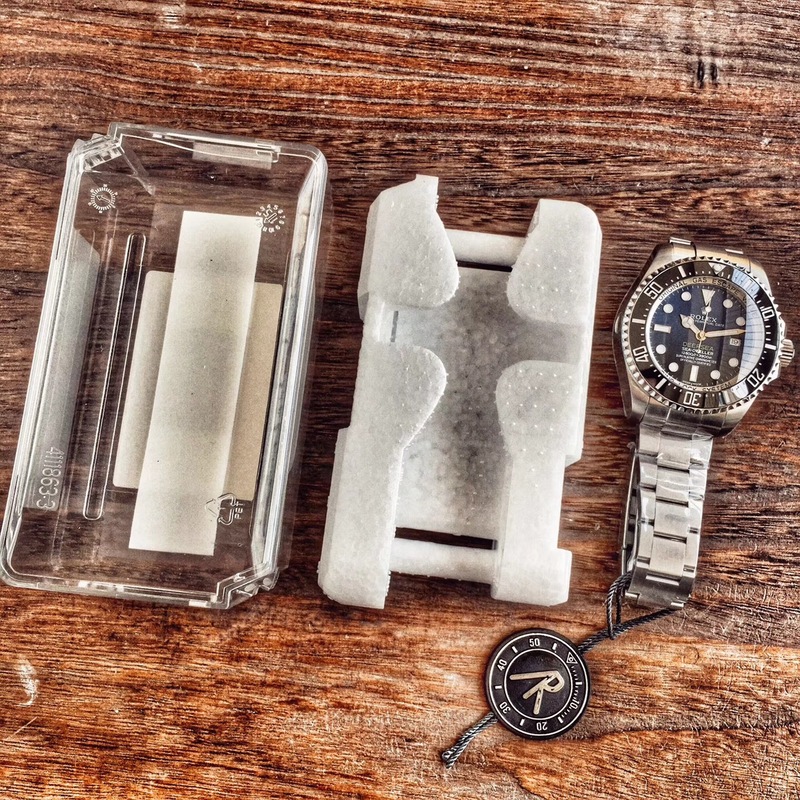 Most YachtMaster has two case sizes, 40mm and 44mm. 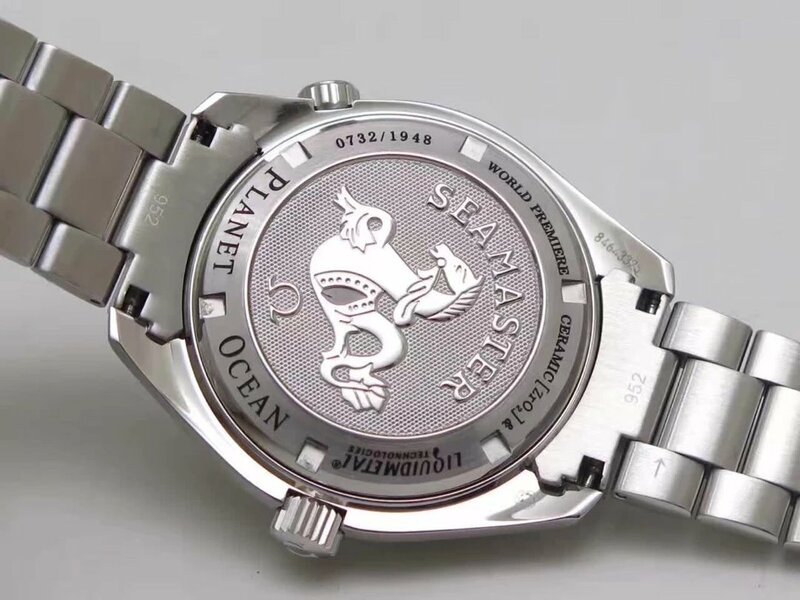 Now I am going to introduce a smaller size, this YachtMaster 268622 is 37mm in case diameter. 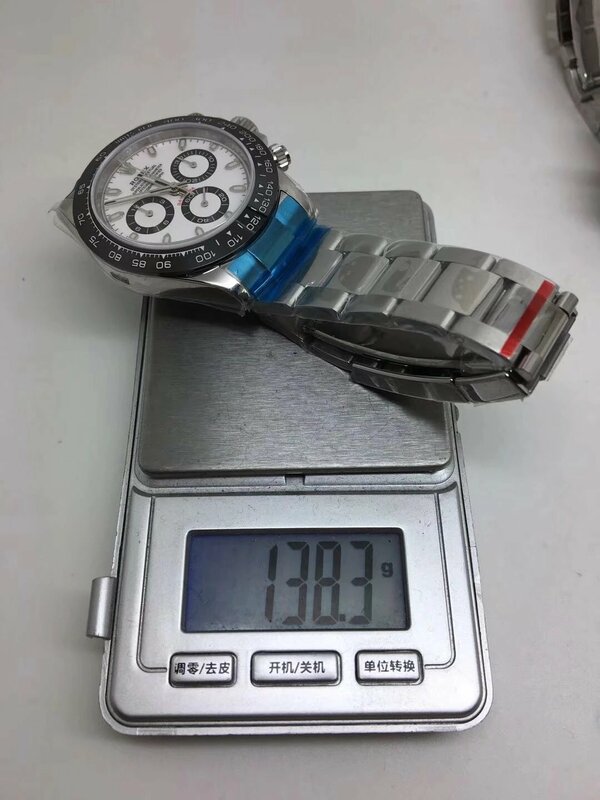 It is a replica made by AR factory. 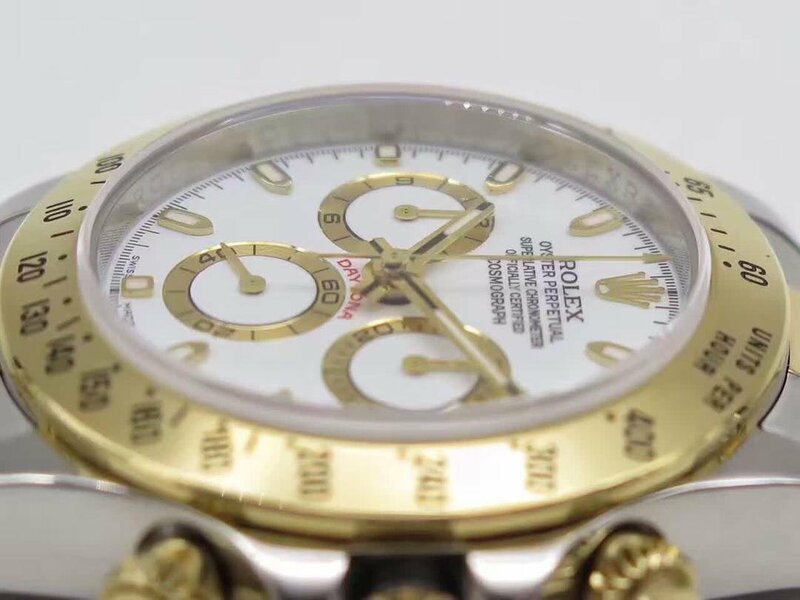 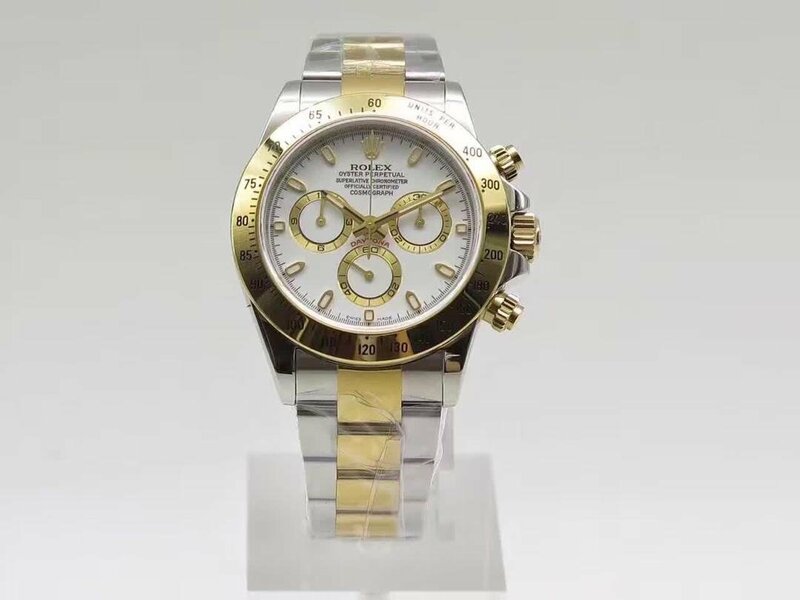 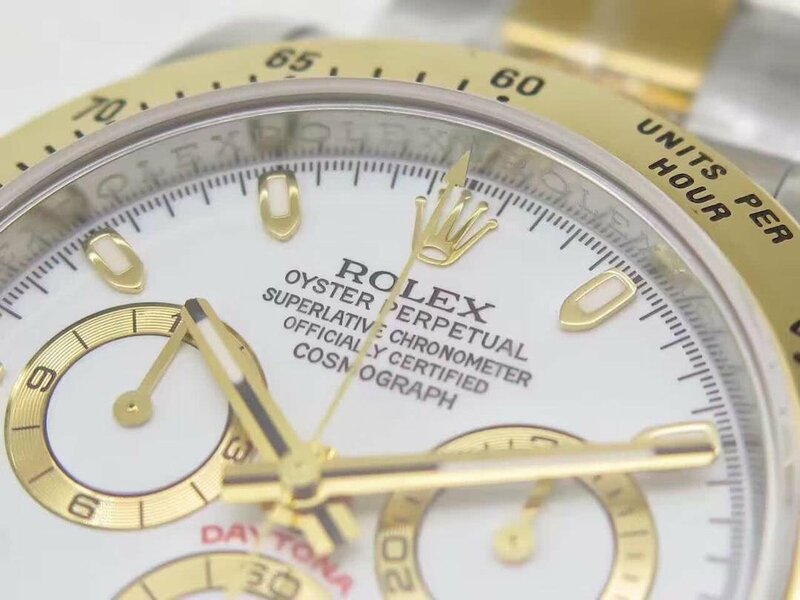 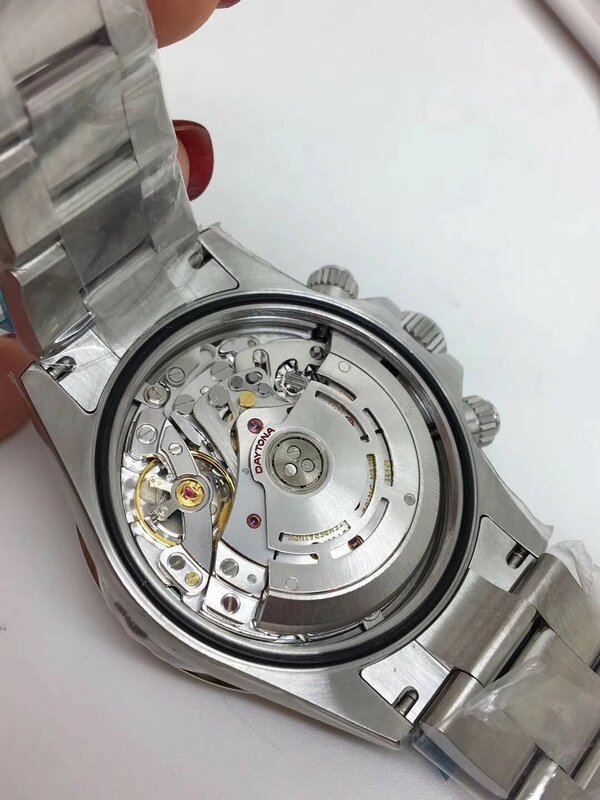 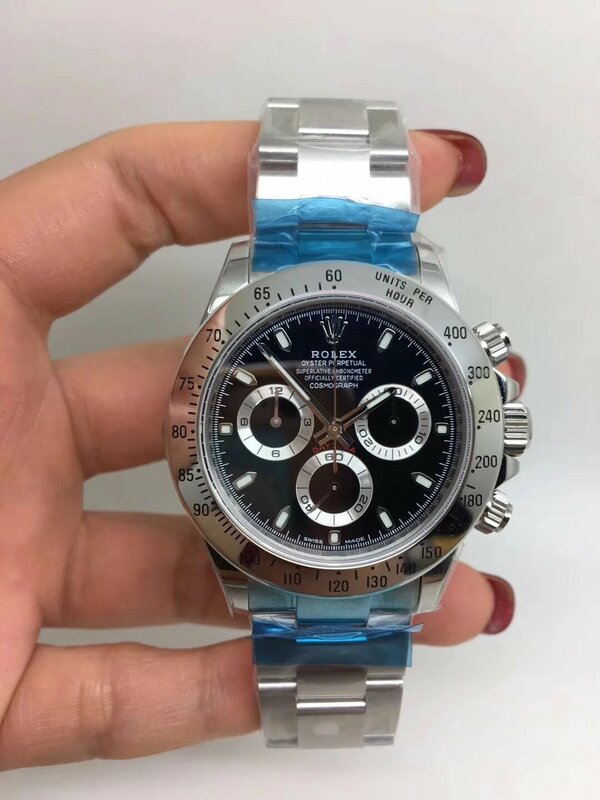 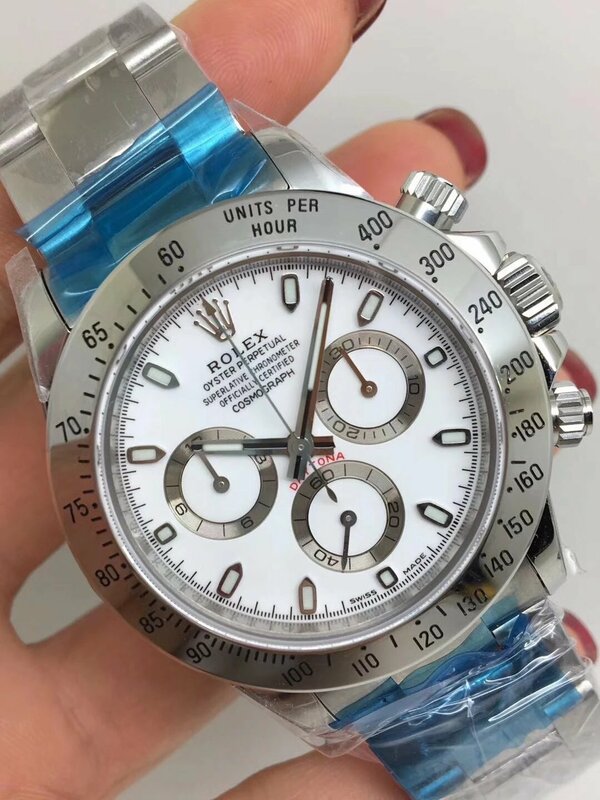 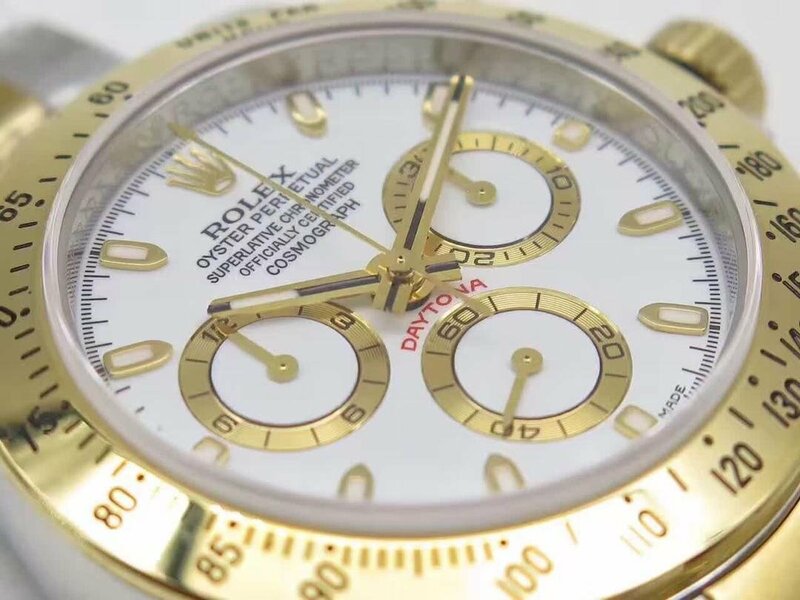 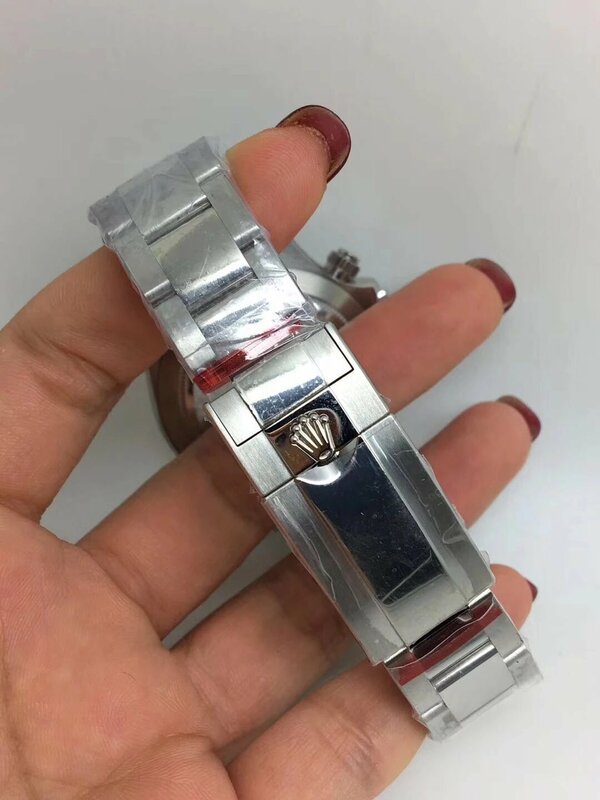 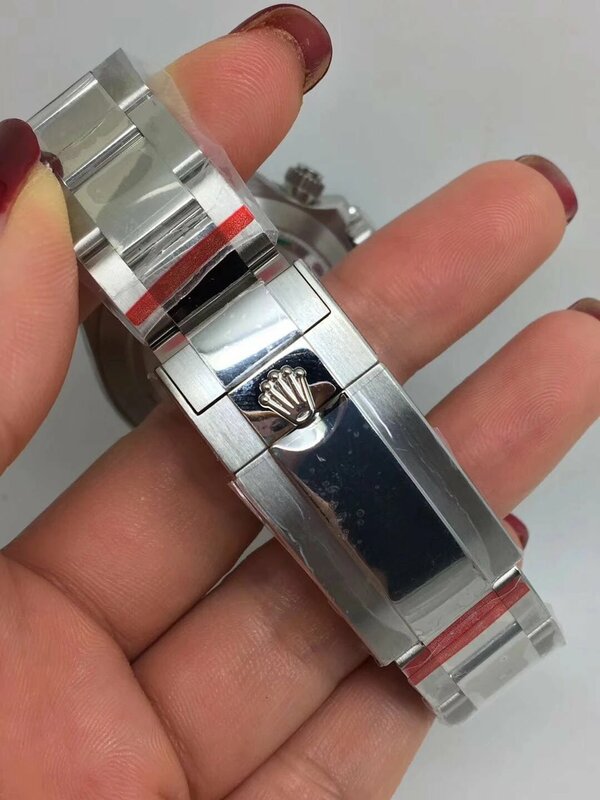 I have introduced replica Rolex watches produced by AR factory, so you will know these Rolex watches have one big feature, which is its 904L stainless steel case material. 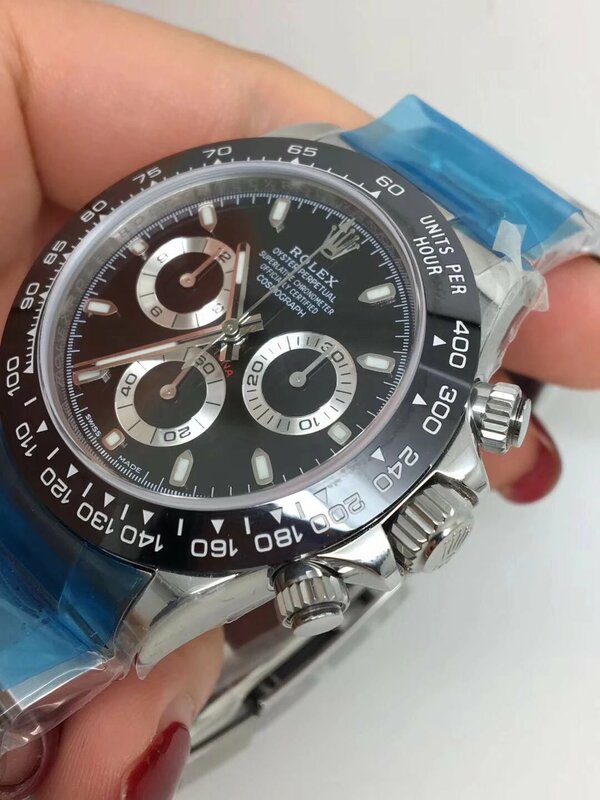 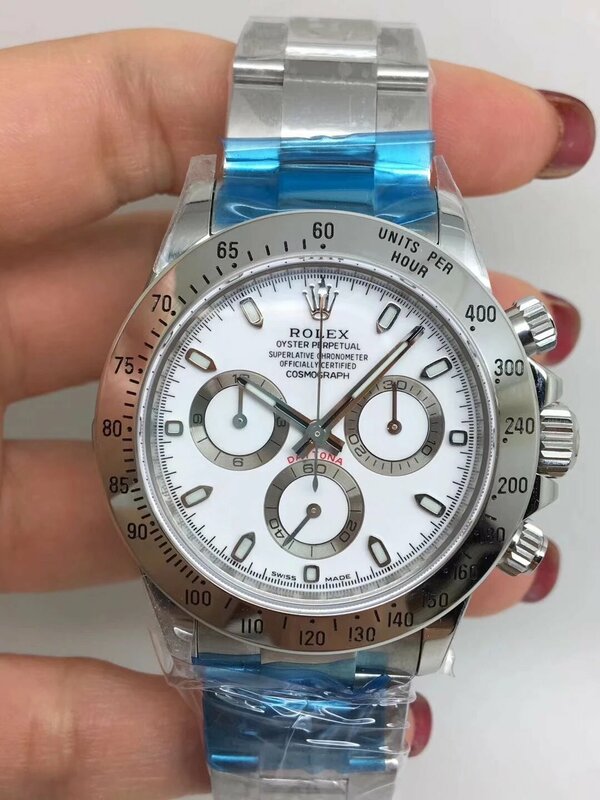 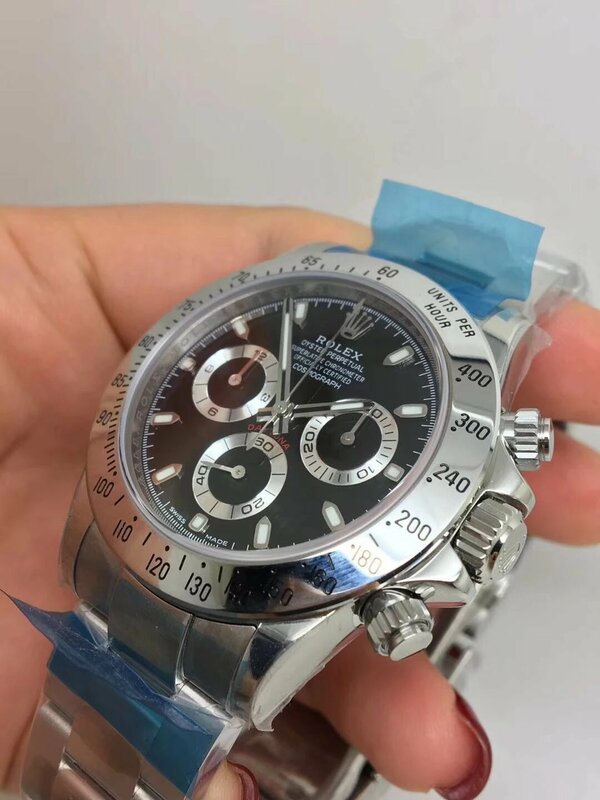 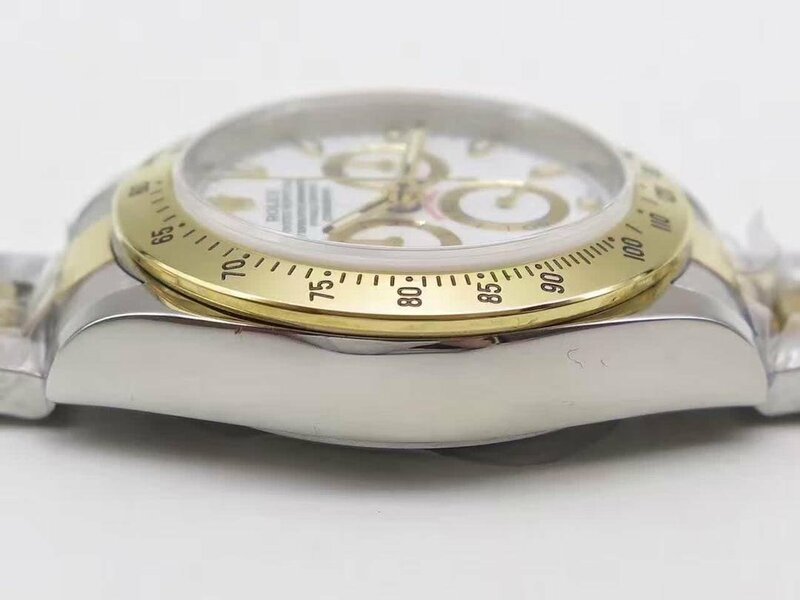 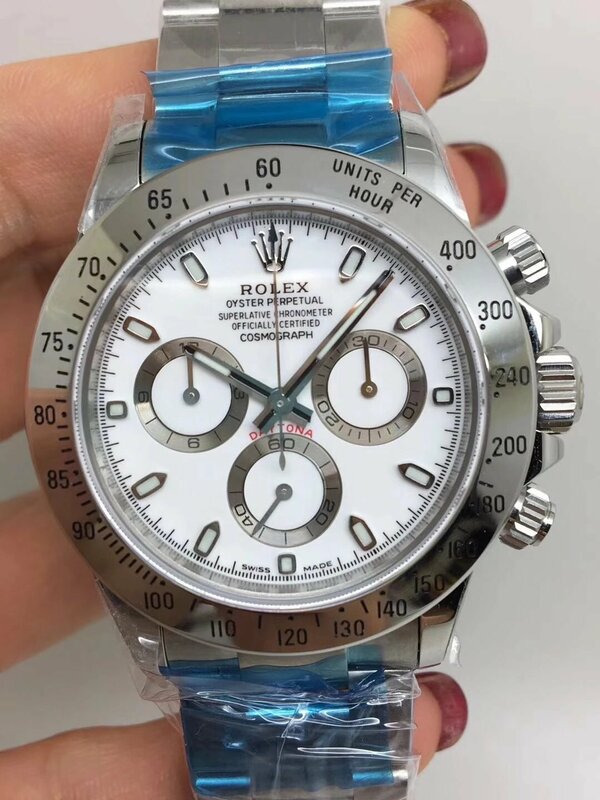 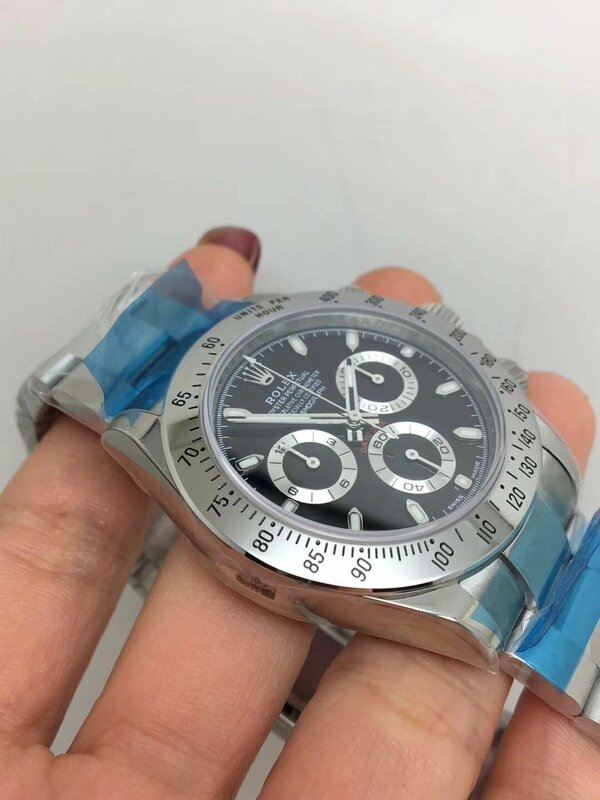 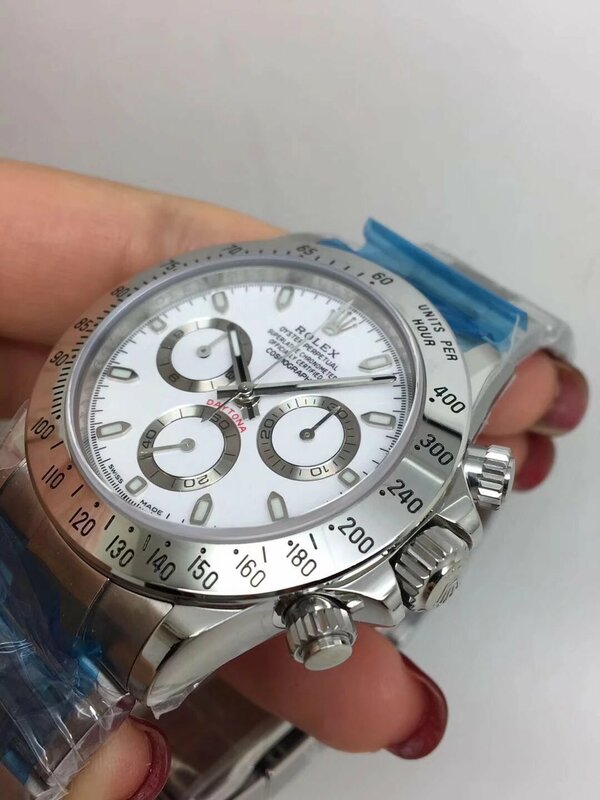 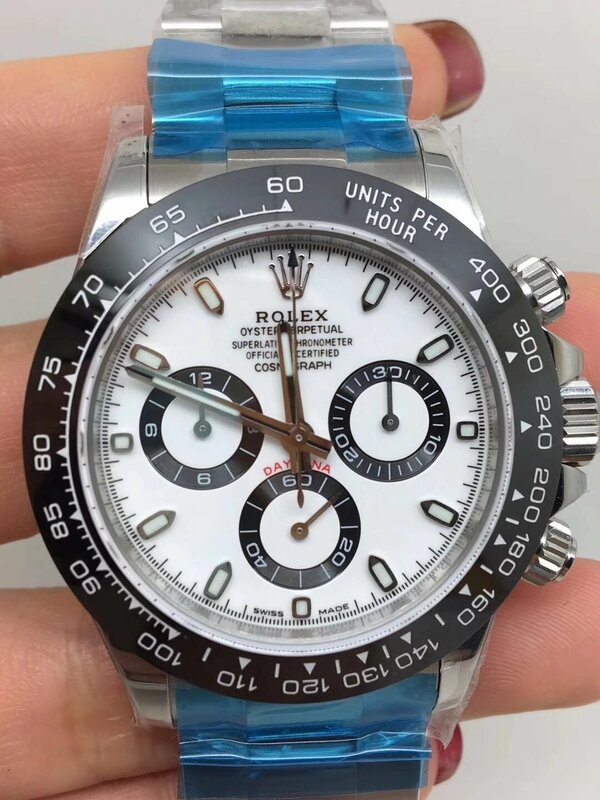 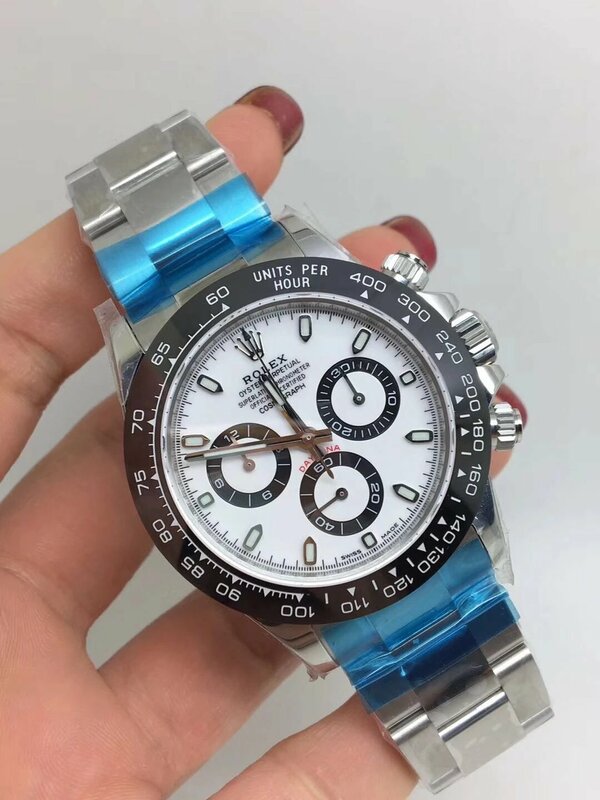 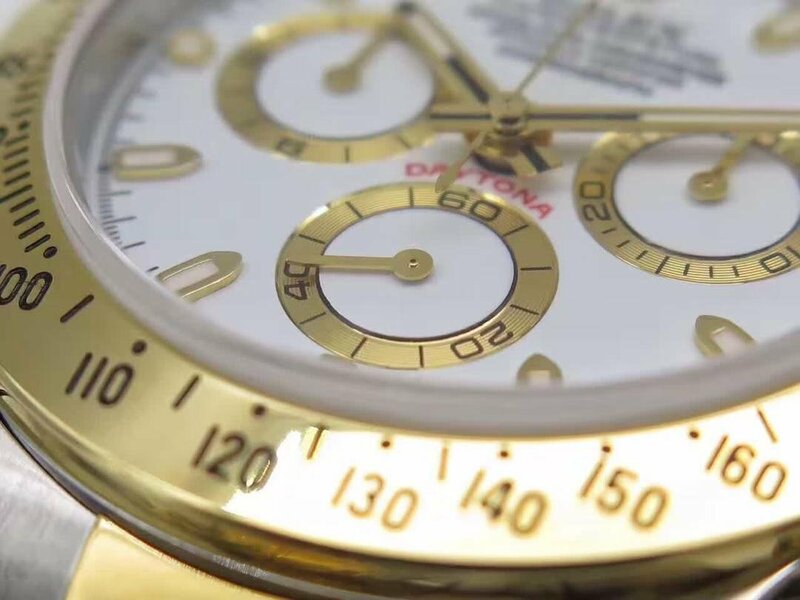 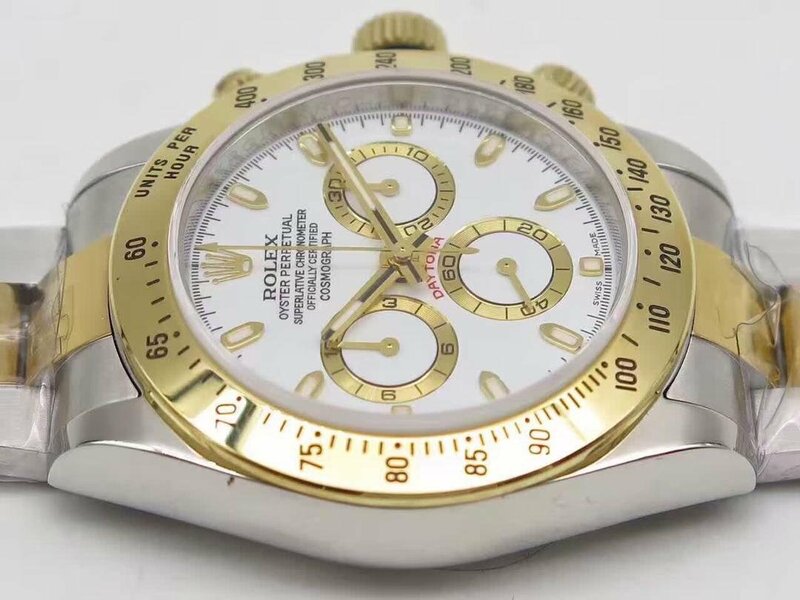 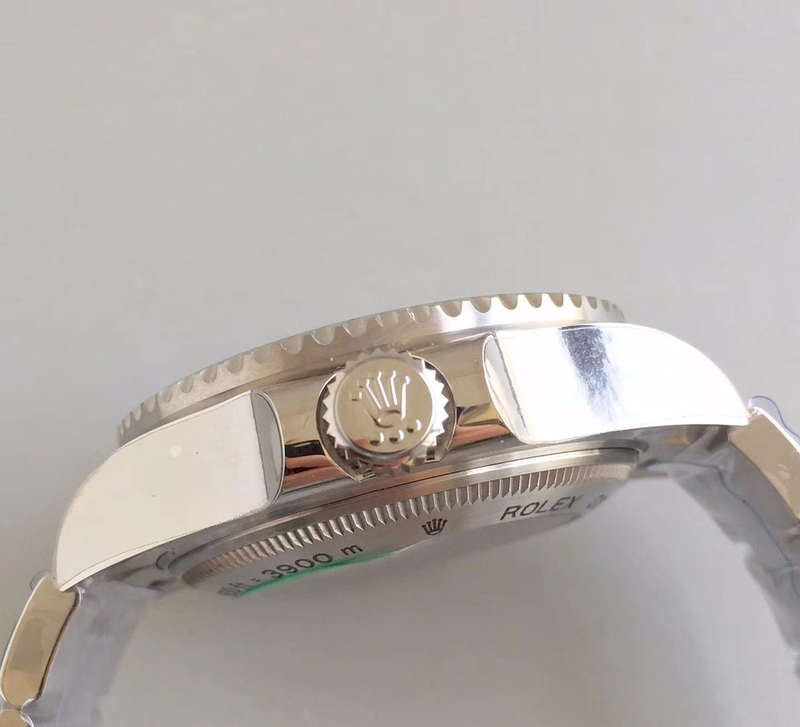 Yes, this replica Rolex YachtMaster 268622 is also made of 904L stainless steel, which is the main reason to explain its higher price than YachtMaster replicas made by other facotories like Noob and BP. 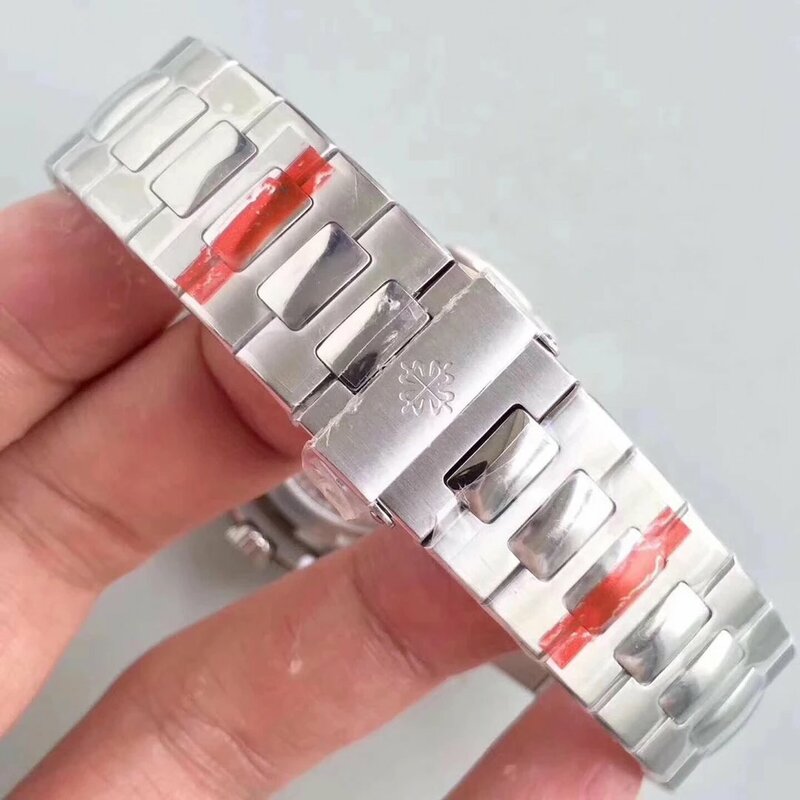 The watch is also very suitable for women who love big-size watches. 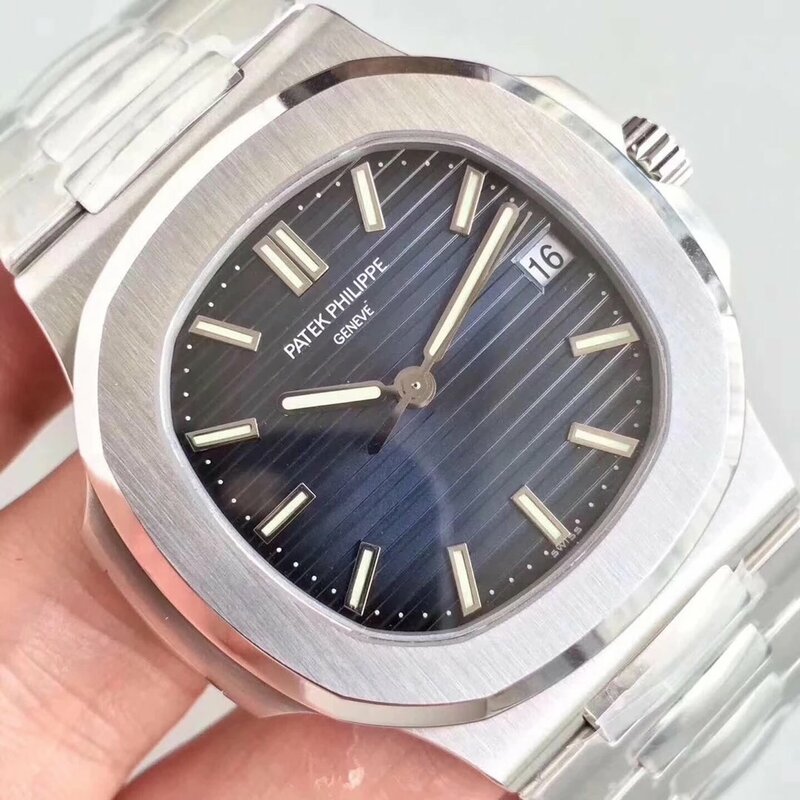 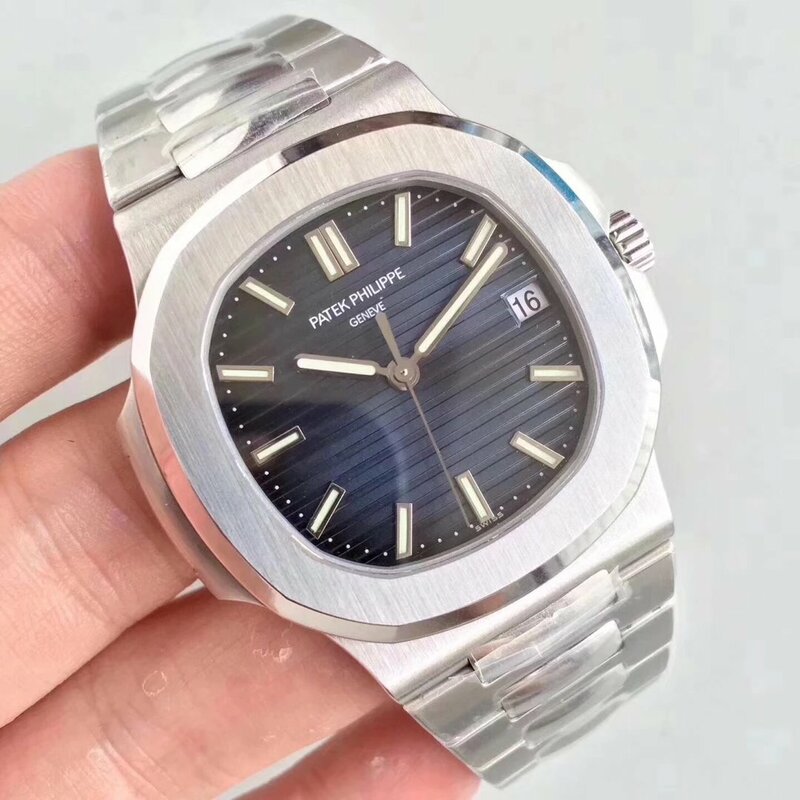 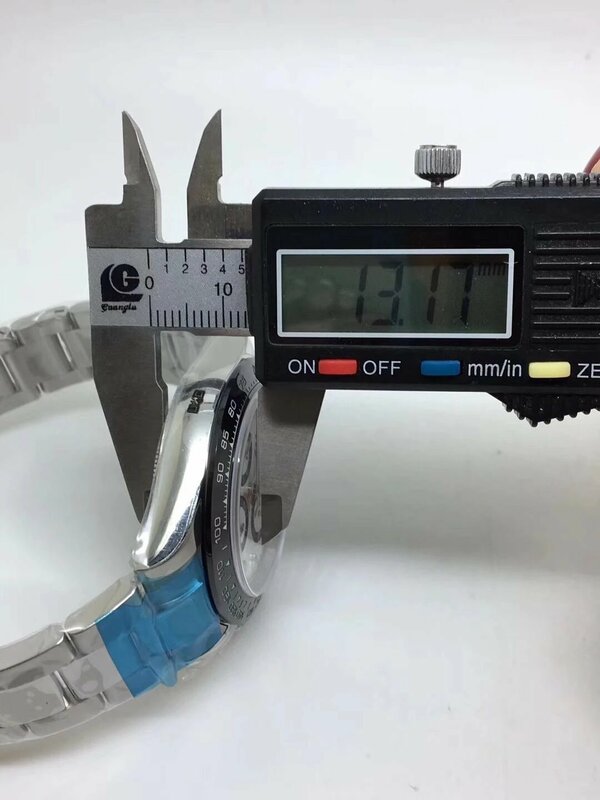 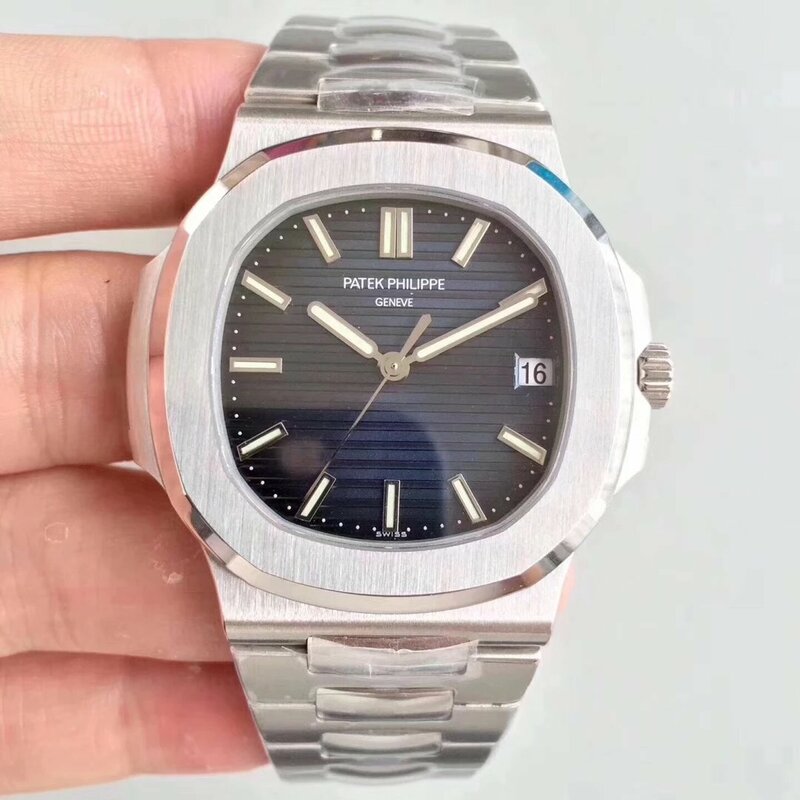 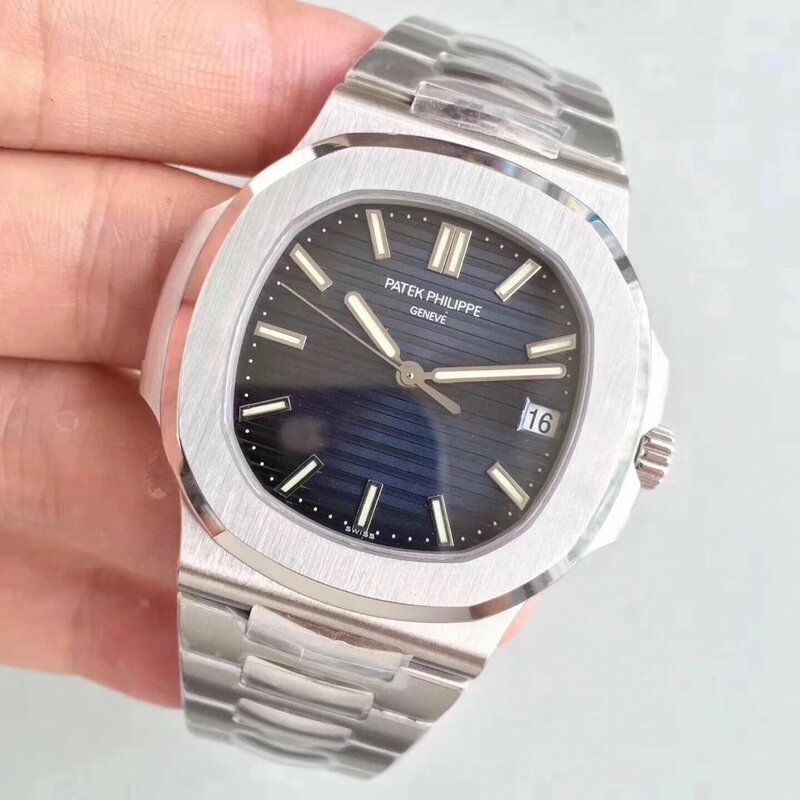 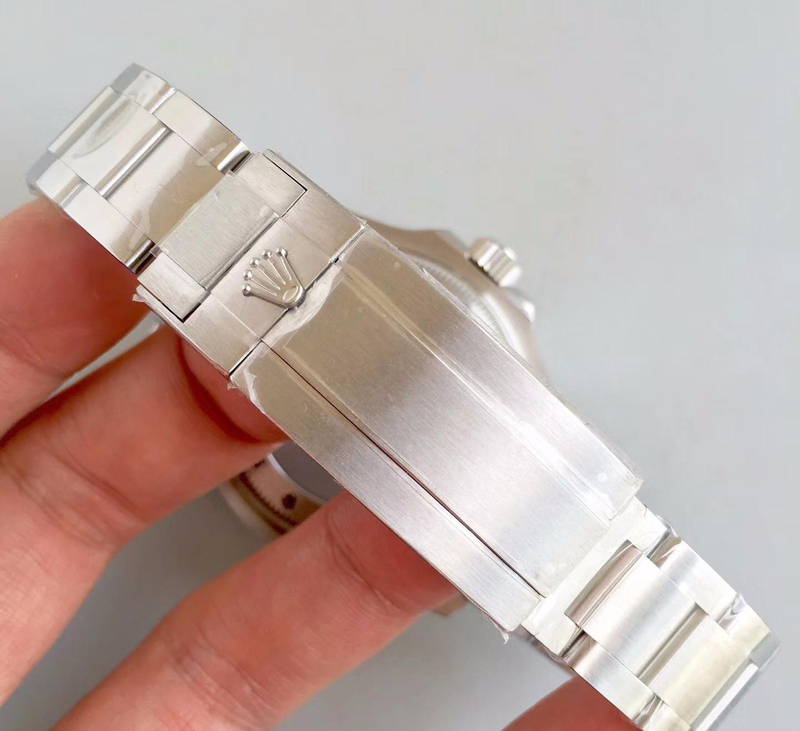 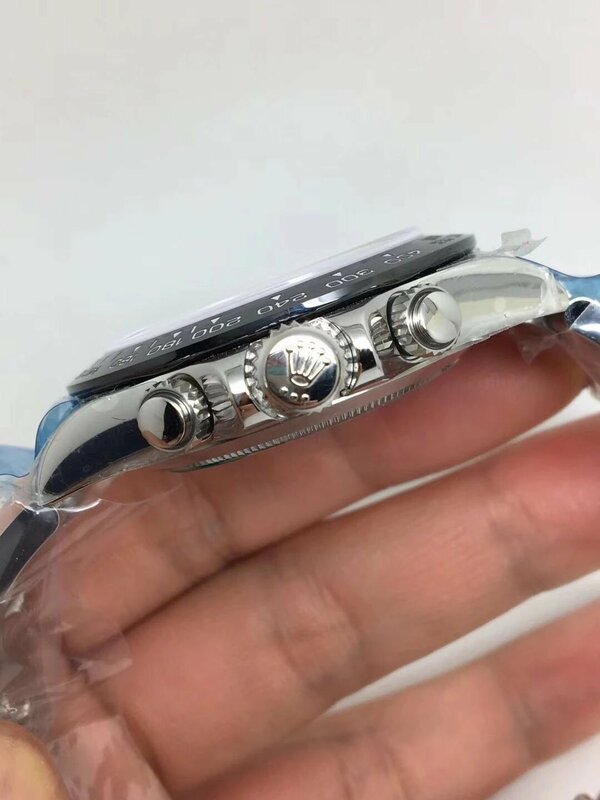 Genuine watch uses platinum to make the case, while this replica is made of 904L stainless steel, this has already been a big improvement compared with those Rolex replicas that use 316L stainless steel. 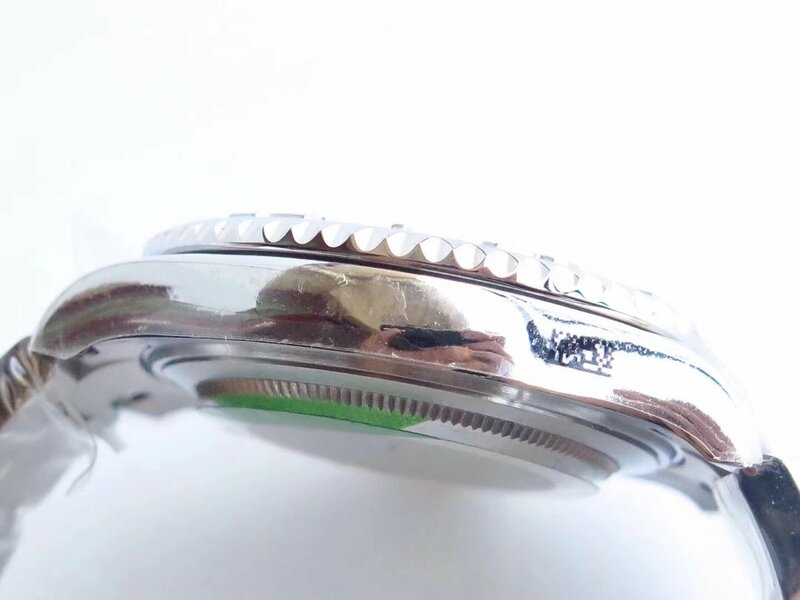 Case is brushed except the four polished lugs. 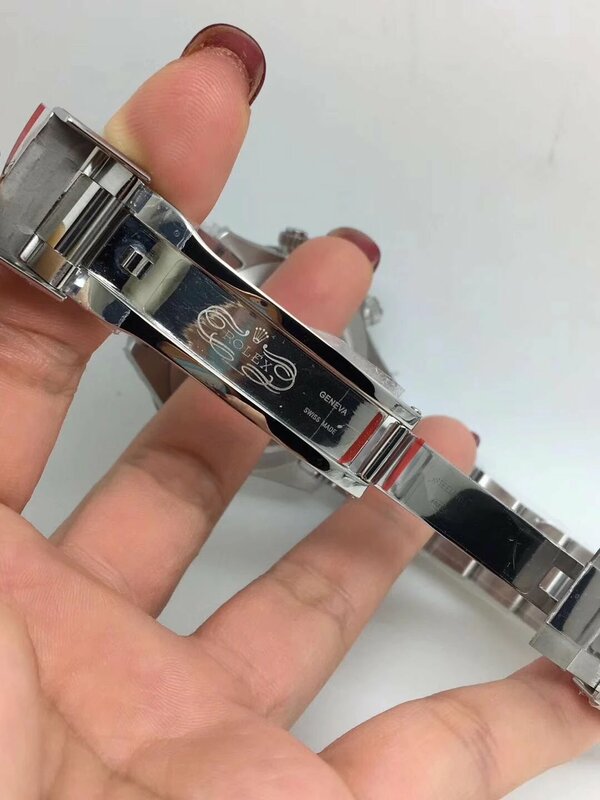 Bezel is bi-directional rotatable, 60-minute graduated bezel is also made of 904L stainless steel, there are polished raised numerals and graduations on the bezel, which are standing out against a sand-blasted bezel background. 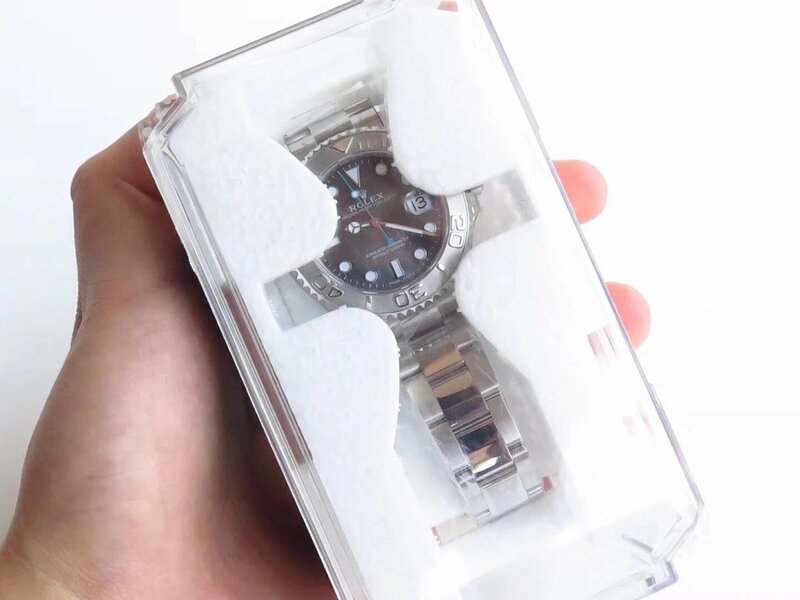 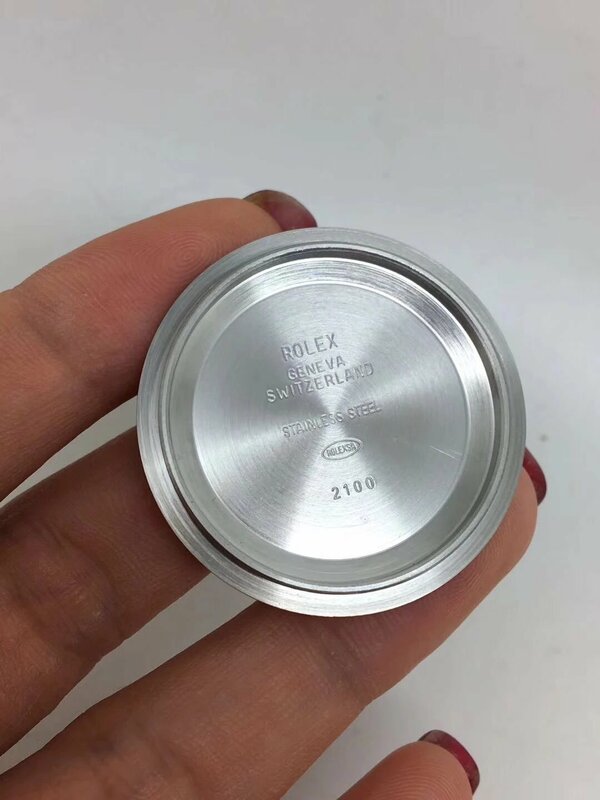 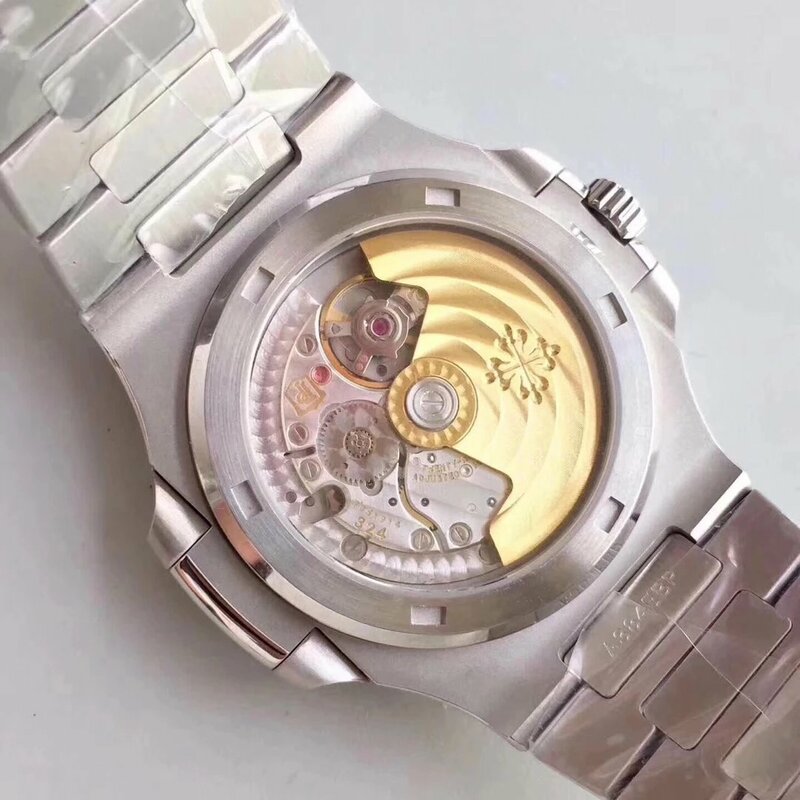 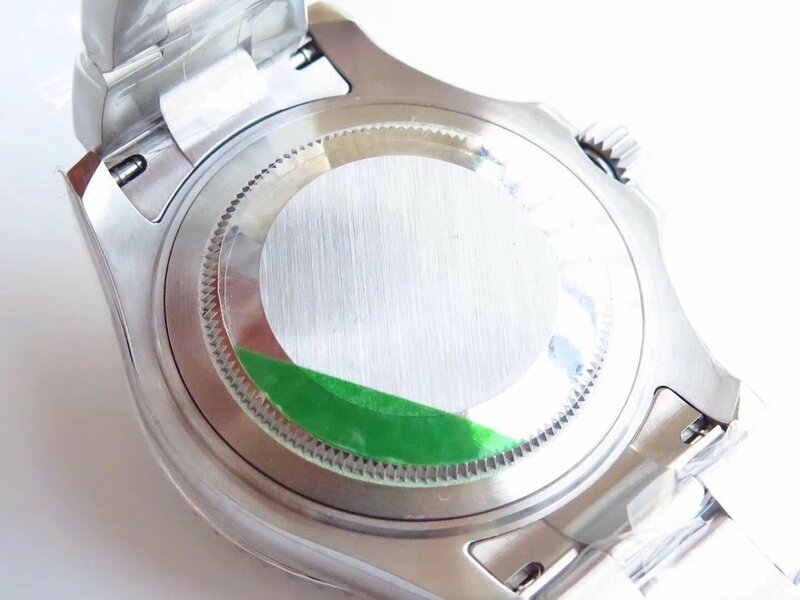 Case back is solid stainless steel made and is screwed down, there are special tooth design for you to open with special watch tool. 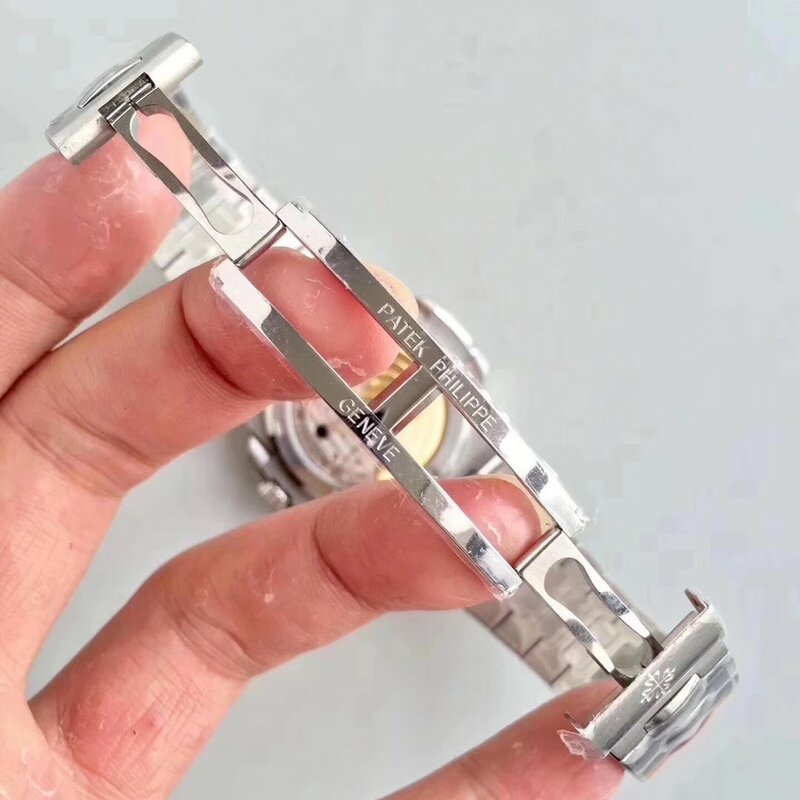 The dial is the most eye-catching place of the replica watch, even though it has a big difference with the dial of genuine watch that features distinctive sun-ray patterns. 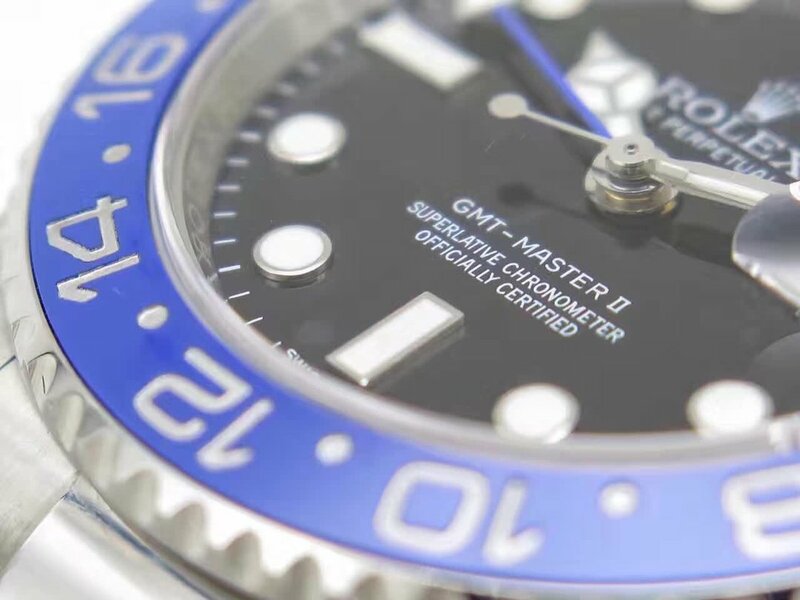 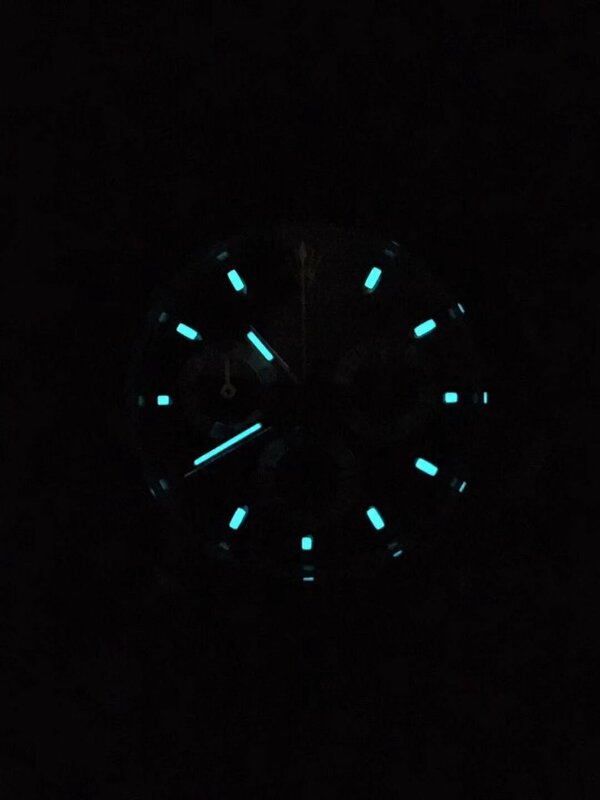 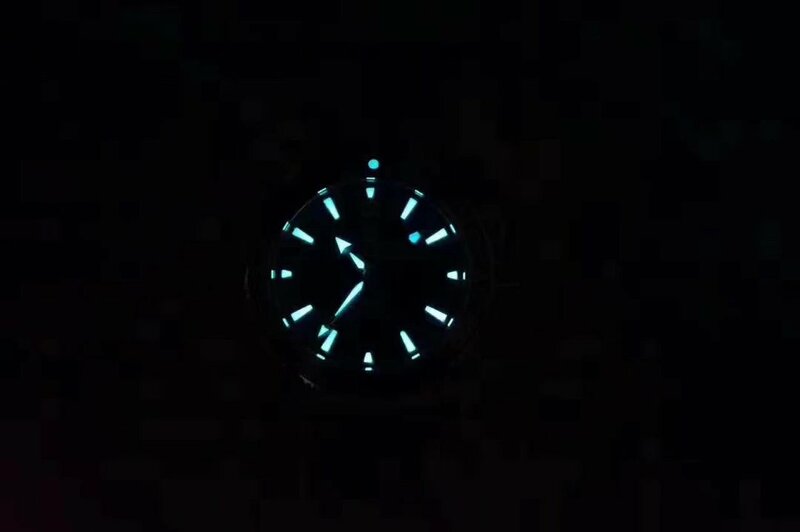 Besides its strong blue superlume, the clean and fresh blue second hand and blue “YACHT-MASTER” printing surprise me. 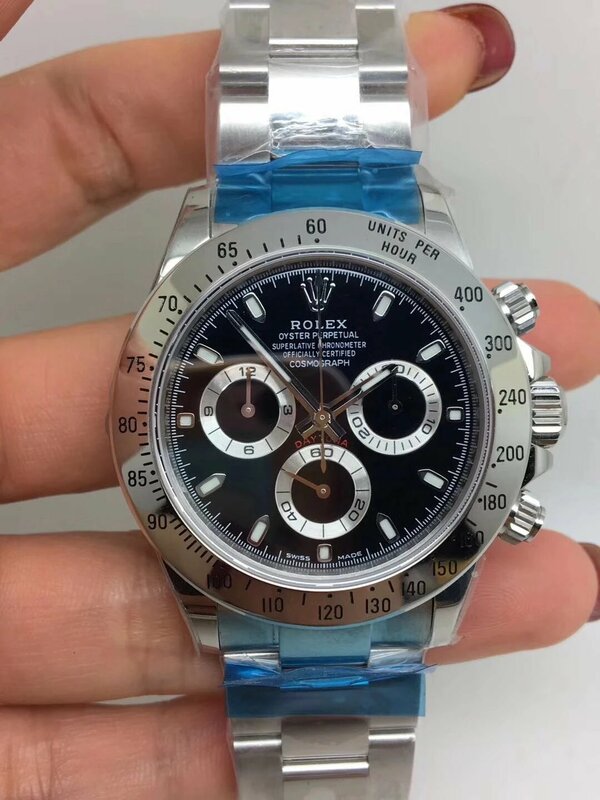 This blue color on the dial is the only place that makes my decision to buy such a grey Rolex watch. 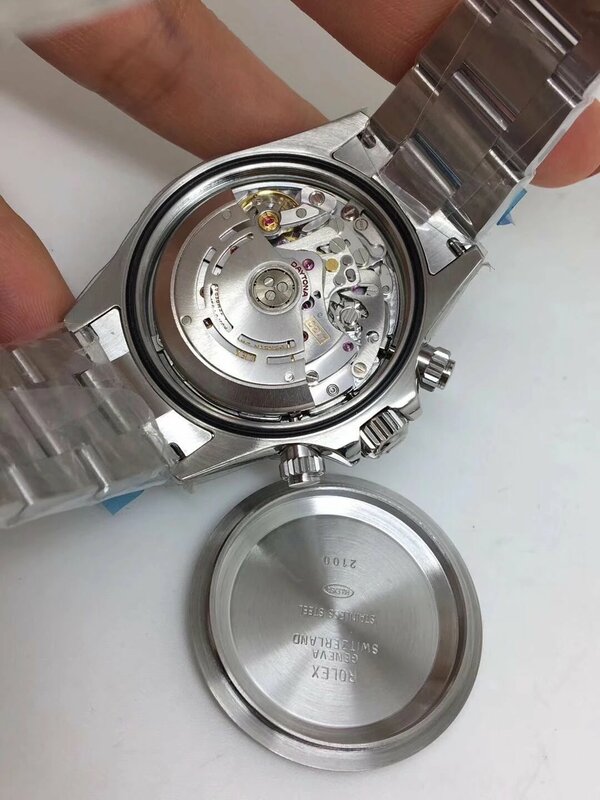 Date window is set at 3 o’clock position, there is a correct 2.5X date mag on the sapphire crystal. 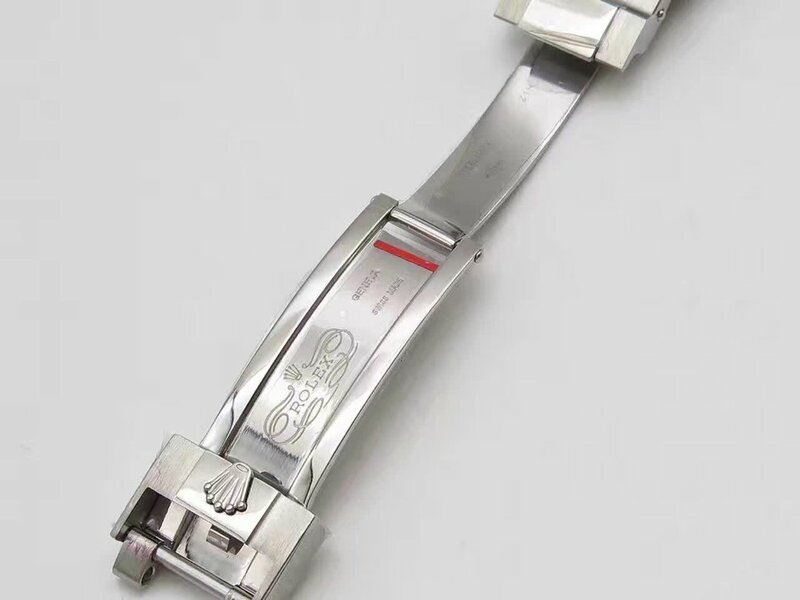 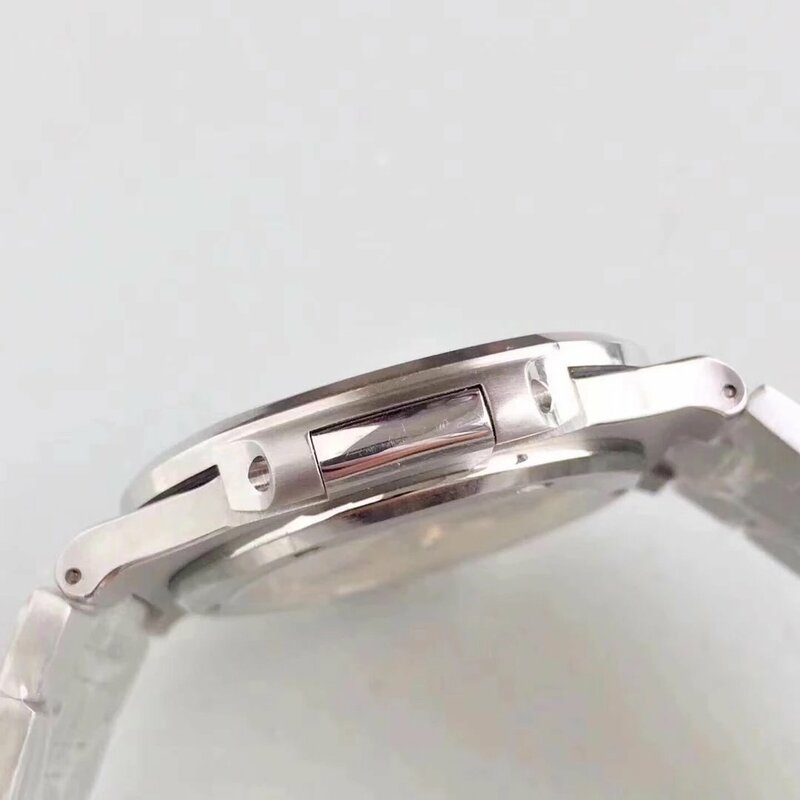 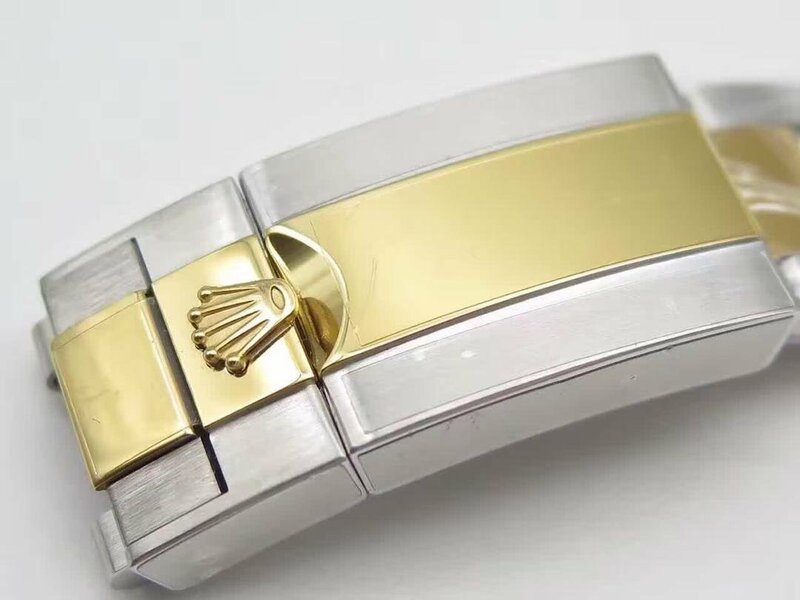 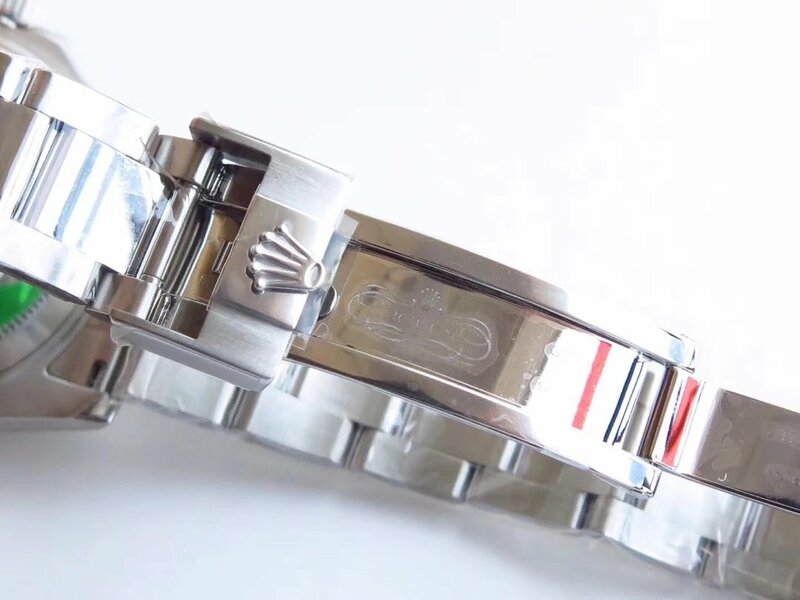 The watch is equipped with an oyster steel bracelet, whose middle links are polished and links on both sides are brushed, this gives the wearer a good visual enjoyment. 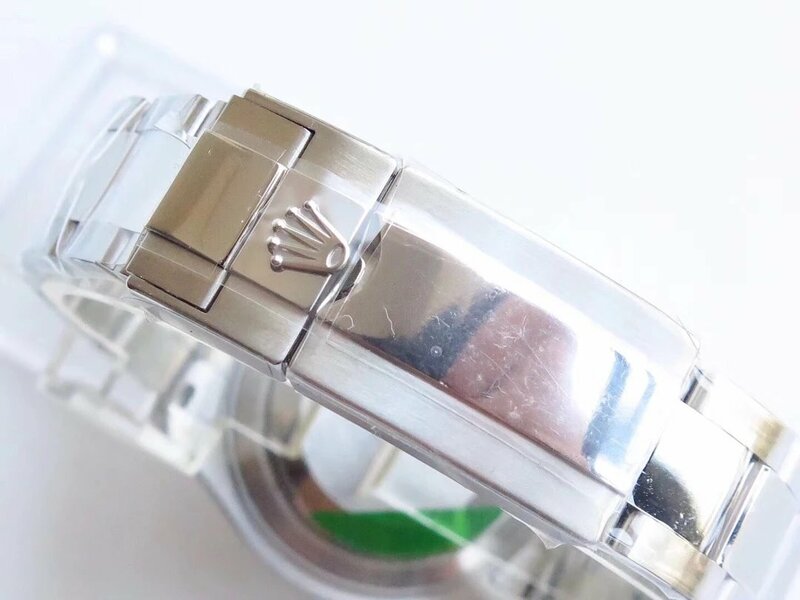 Every link of the bracelet is made of solid stainless steel. 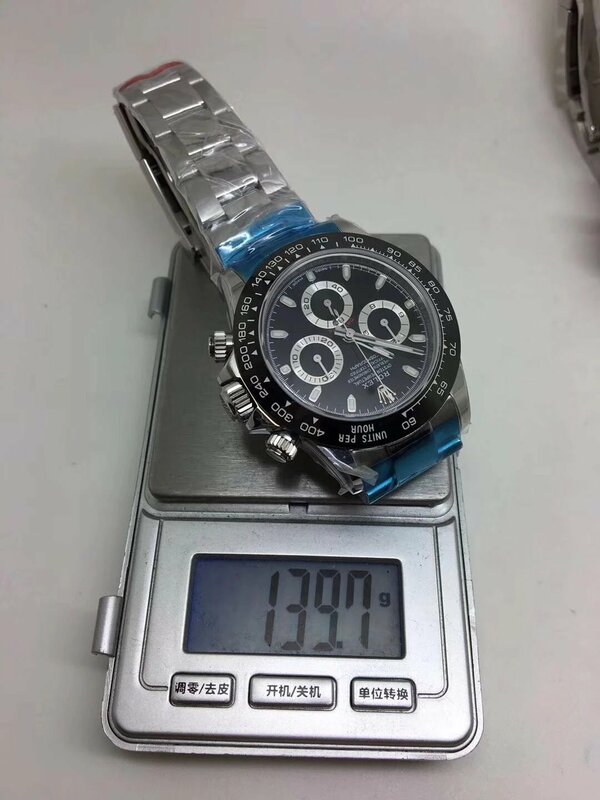 The whole replica watch will have the similar weight per genuine. 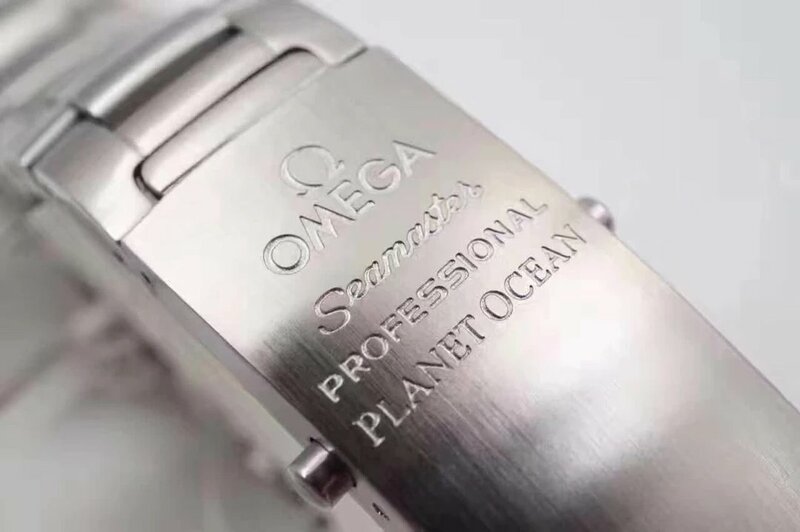 Fitted with a deployant clasp, these engravings on clasp are blackened, the clasp has the same construction as genuine watch. 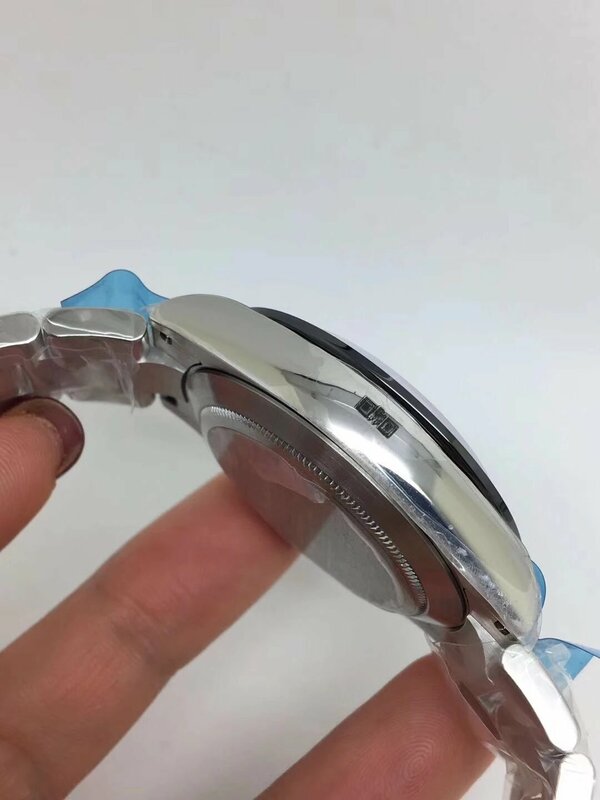 By the way, one pair of black rubber strap could be offered for the watch. 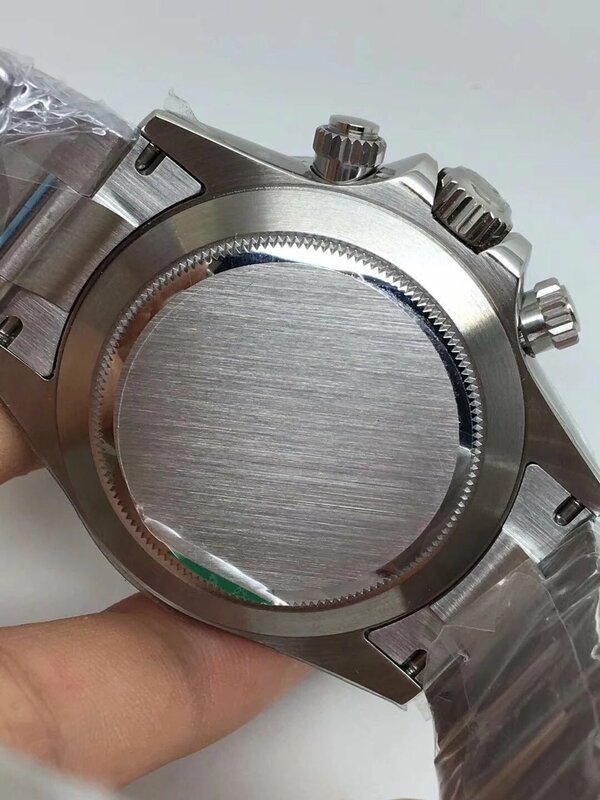 Today, I want to show a great work in our market, it is a big Rolex watch, the ultimate diving watch, nicknamed deepsea king I suppose. 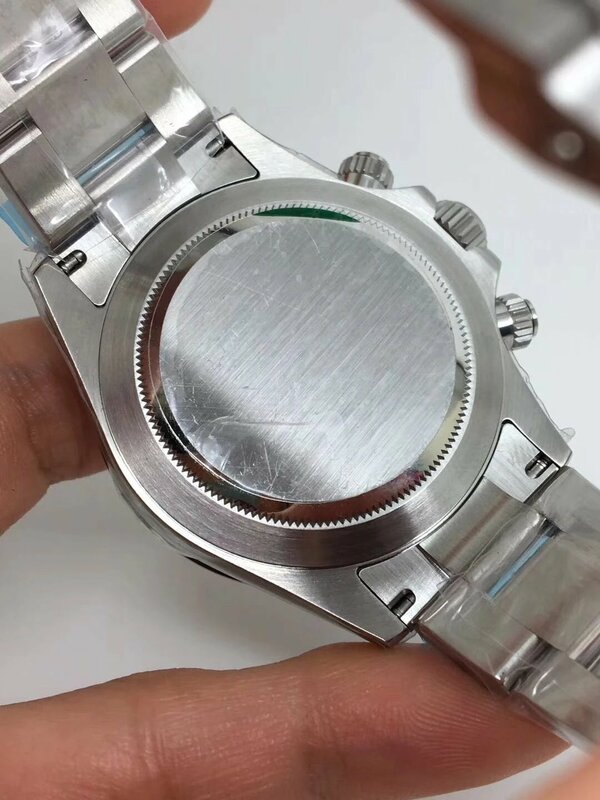 Yes, you will say, “I have bought this watch before, from another factory named Noob.”, when you see these pictures below. 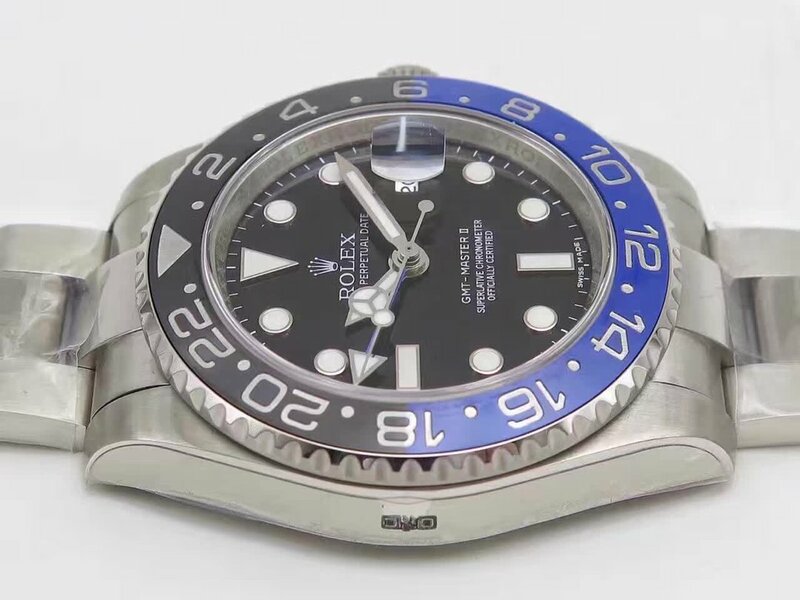 Previous replicas of this Rolex D-Blue 116660 are mainly made by Noob and BP factory, Noob’s version is the best. 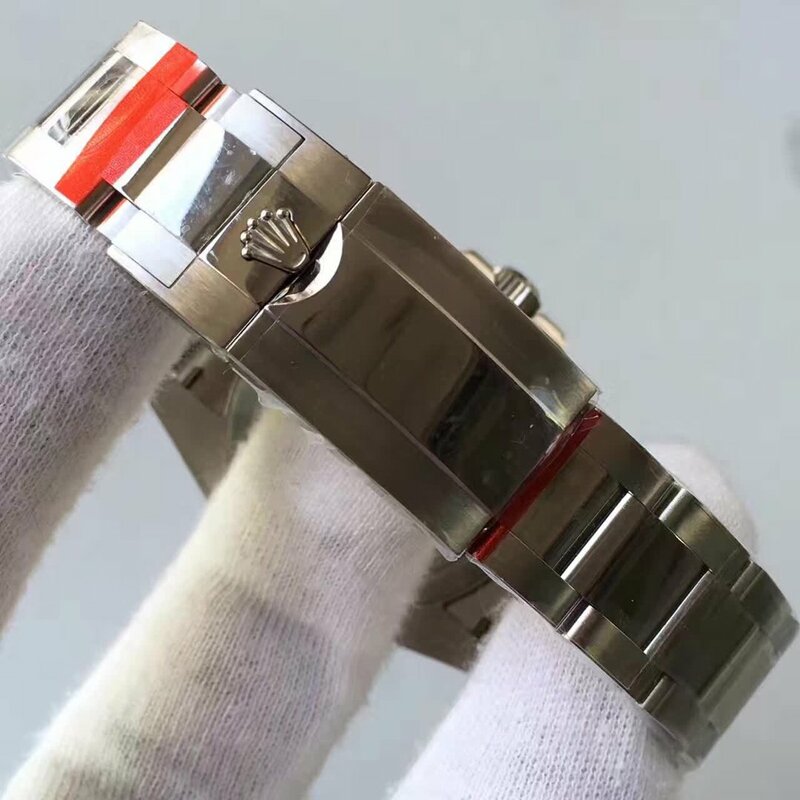 But here I am going to introduce the one from another new rising factory, which is AR. 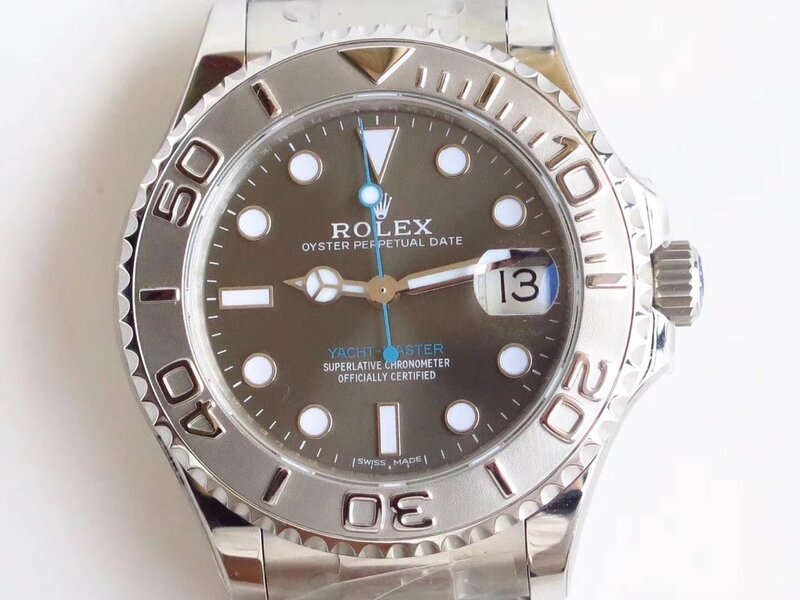 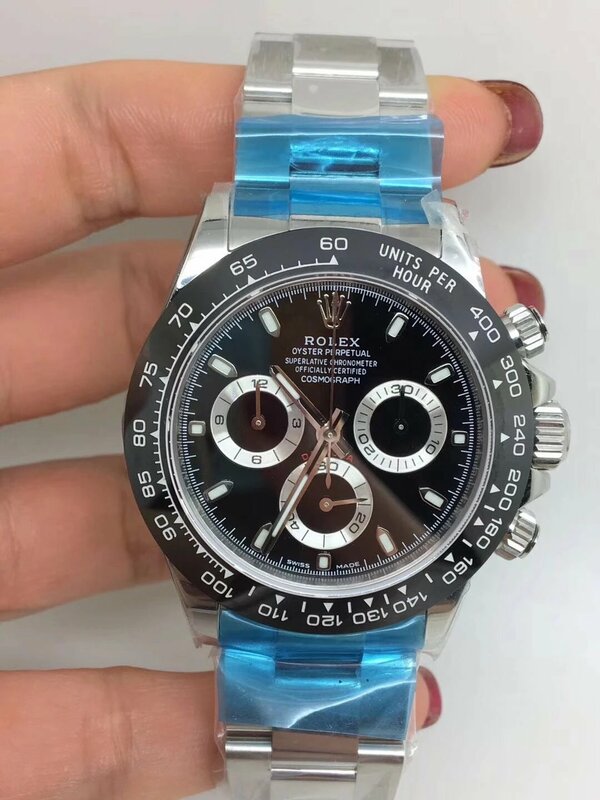 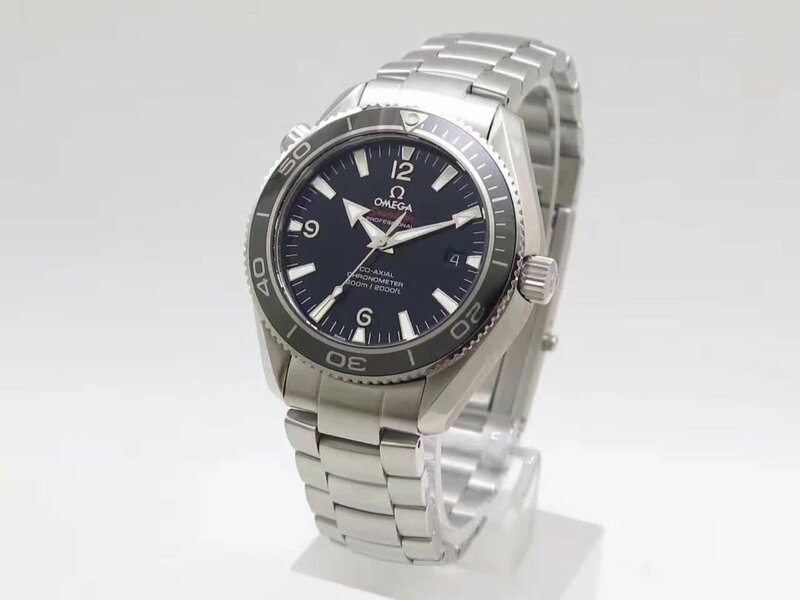 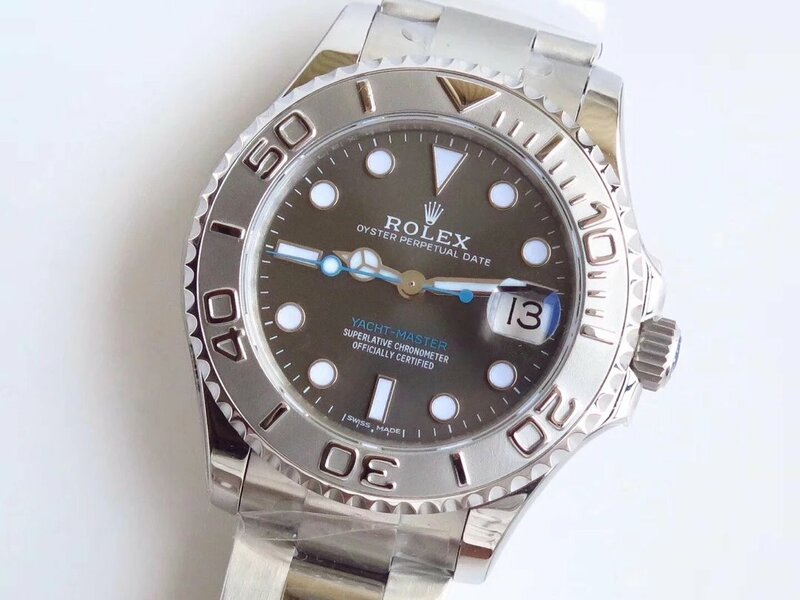 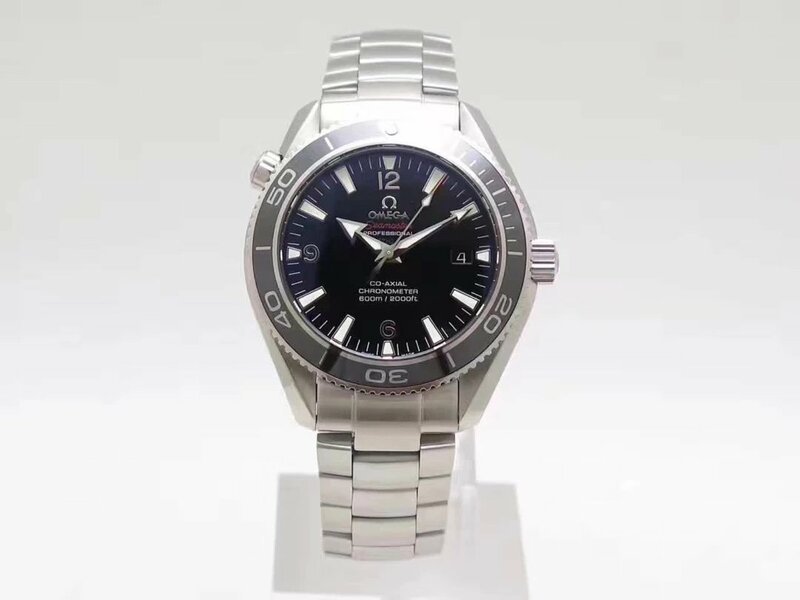 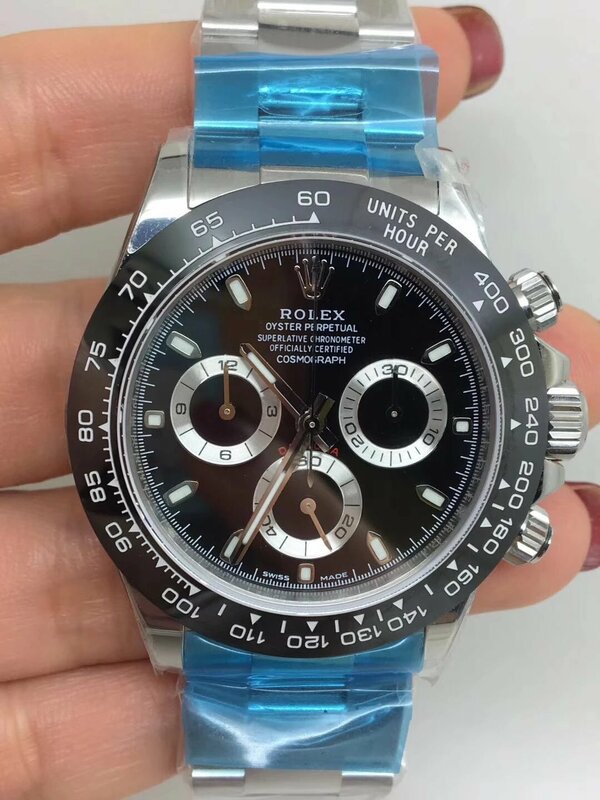 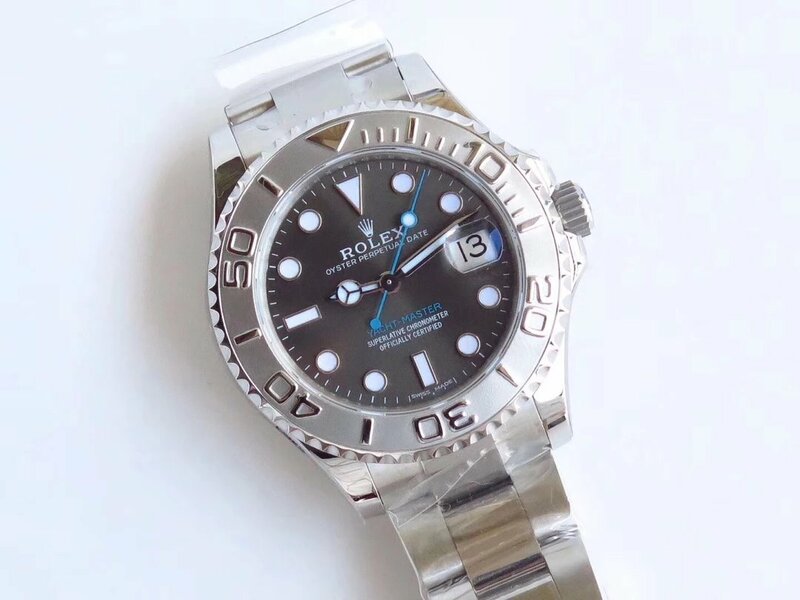 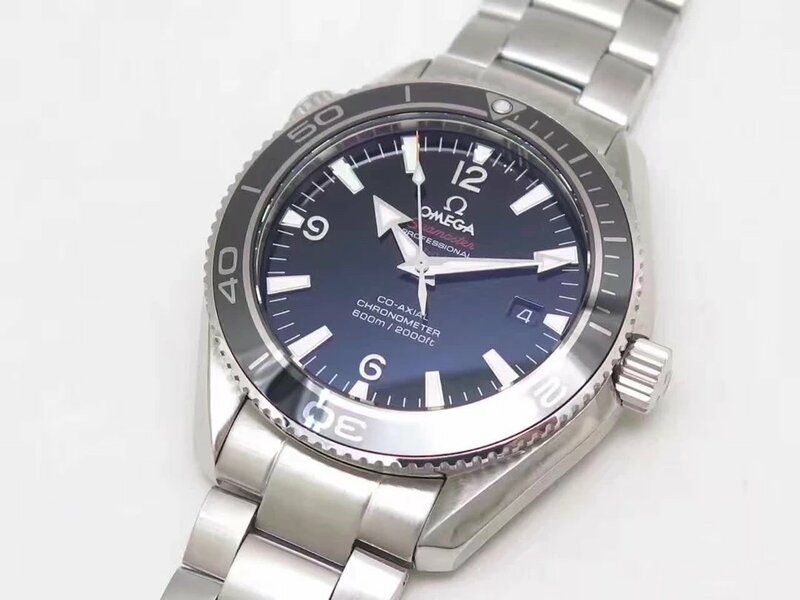 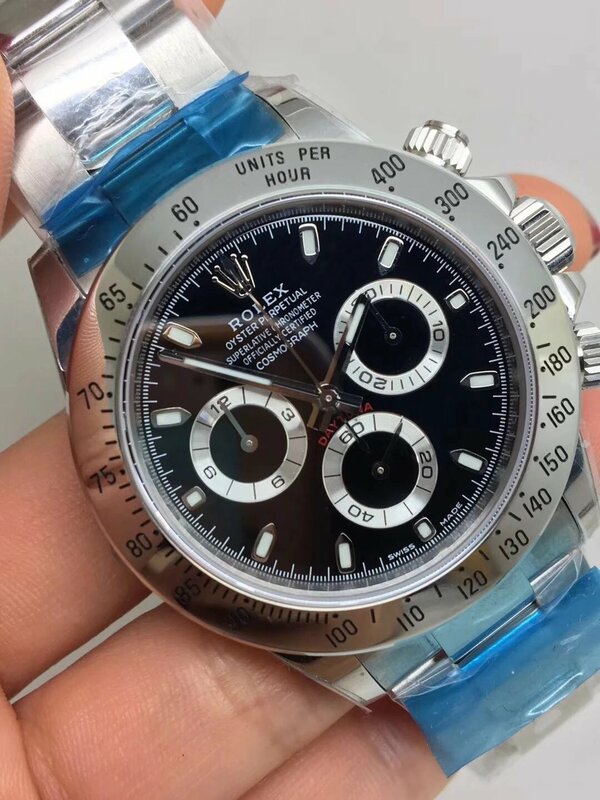 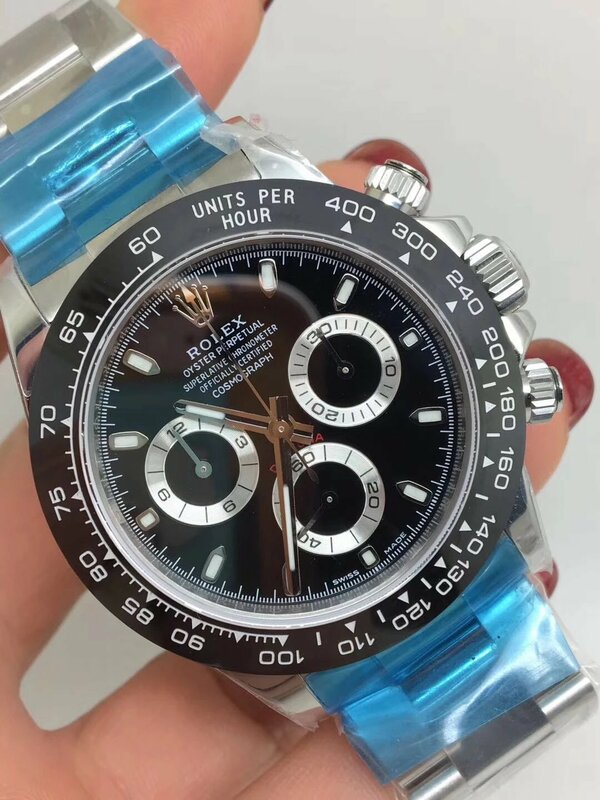 Compared with Noob 116660, this replica from AR factory has two big advantages that make it the best replica Rolex Sea-Dweller DEEPSEA D-Blue 116660 in the market, one is its 904L stainless steel material, the other is the real Swiss ETA 2824 automatic movement it is equipped with. 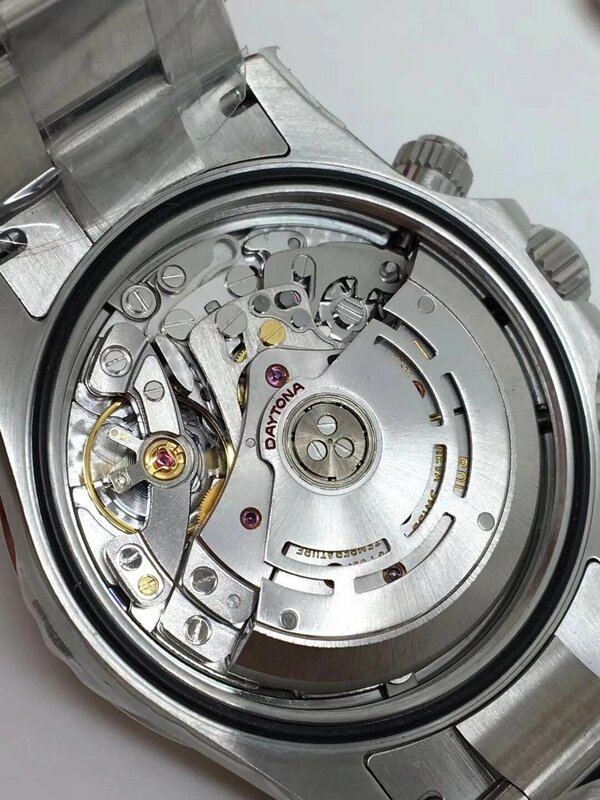 Let’s check its specification first before we discuss further details. 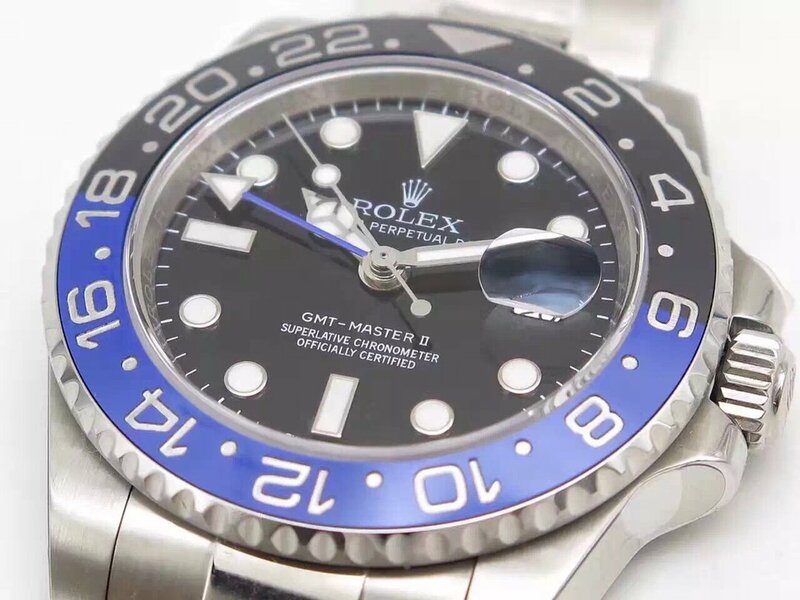 Genuine Rolex DEEPSEA Sea-Dweller D-Blue is famous for its gradient dial, which is blue/black. 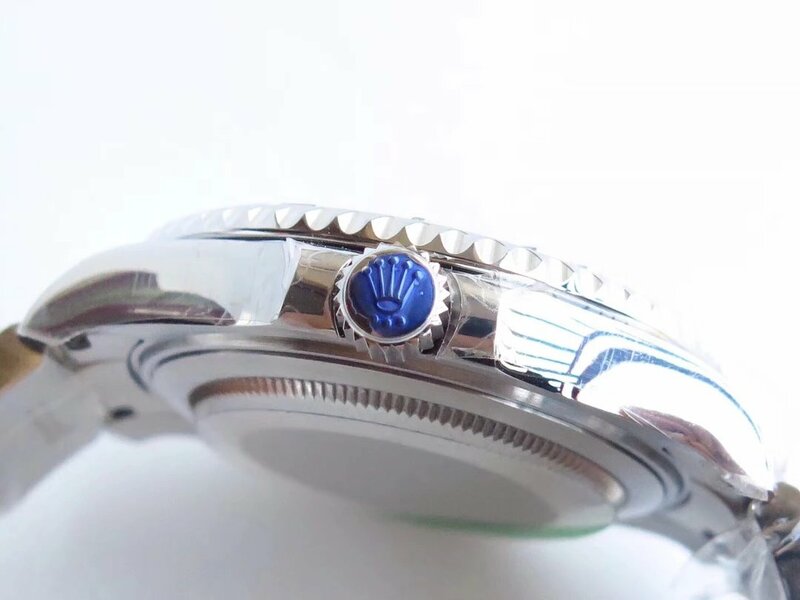 On the replica, the gradient D-Blue dial has the same tone as genuine, it looks very natural. 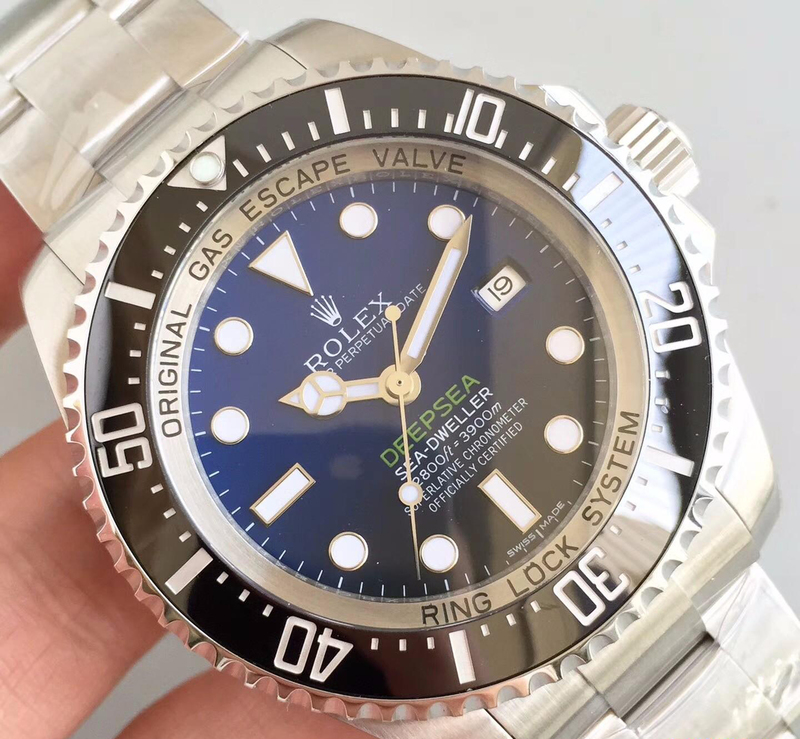 Like genuine, inner bezel ring features black engravings of “ORIGINAL GAS ESCAPE VALVE” and “RING LOCK SYSTEM”. 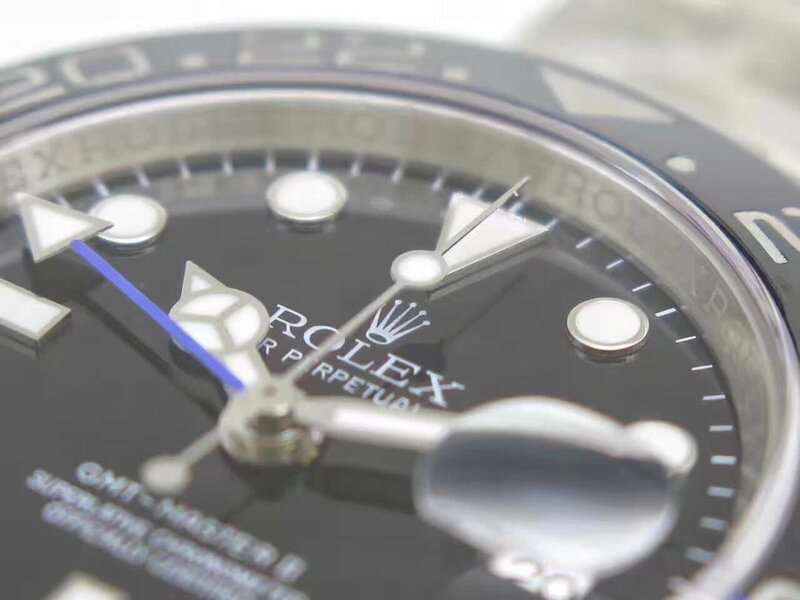 The color transition from black to black is very natural. 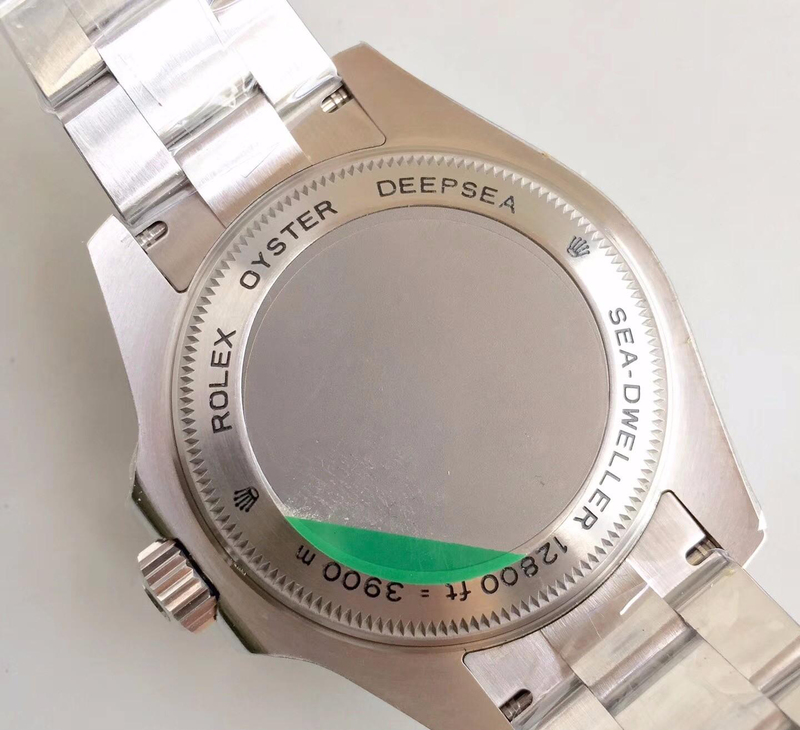 Dial color is ocean especially it features the green word “DEEPSEA”. 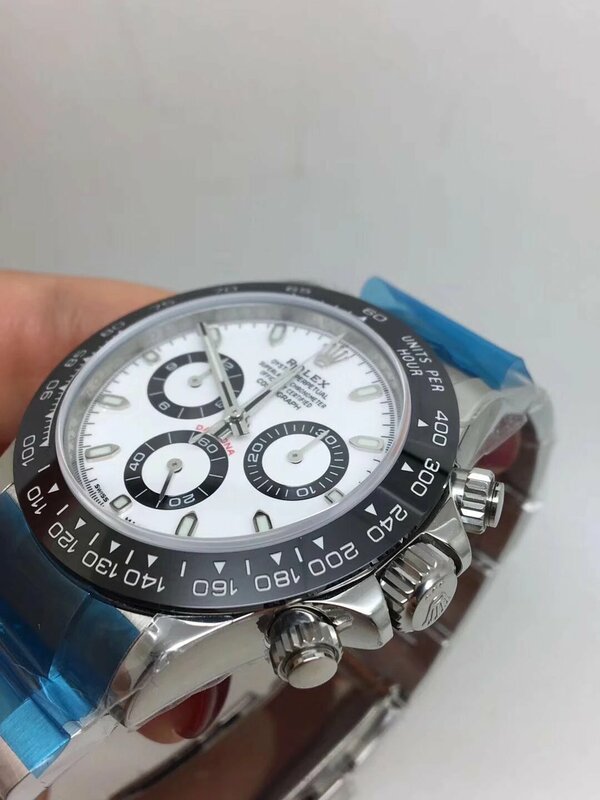 Other printings on the dial are in white. 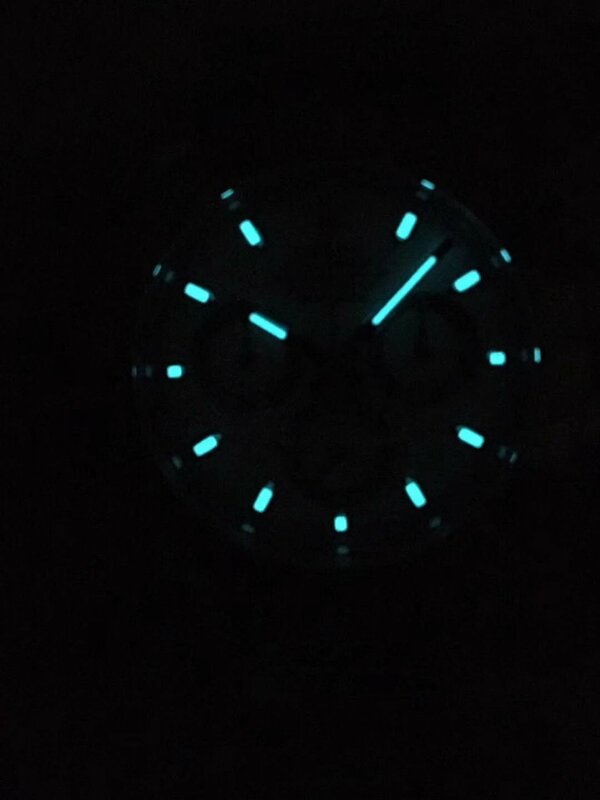 Hour markers and hands are filled with white luminescence, they will emit strong blue light in the dark. 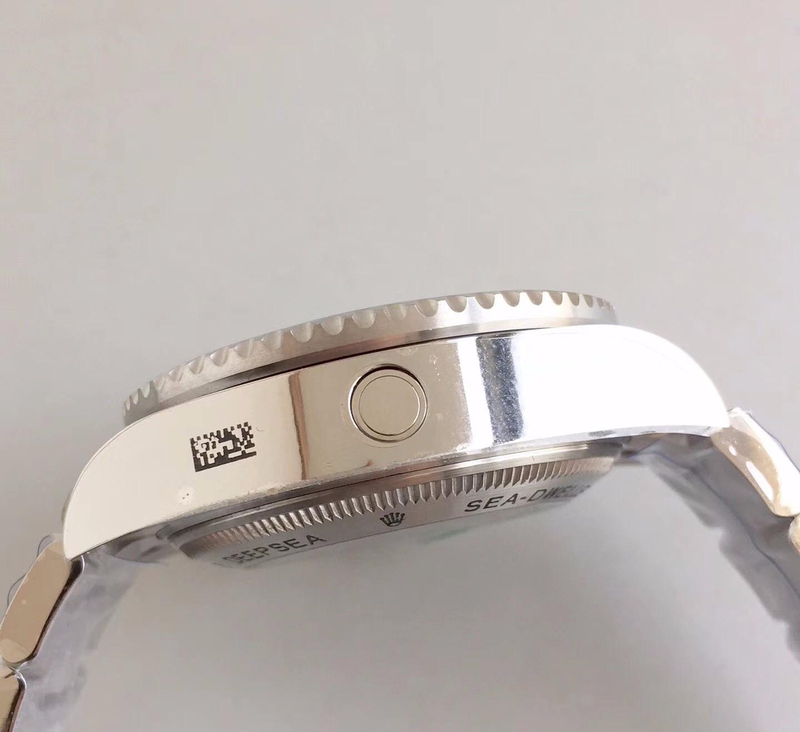 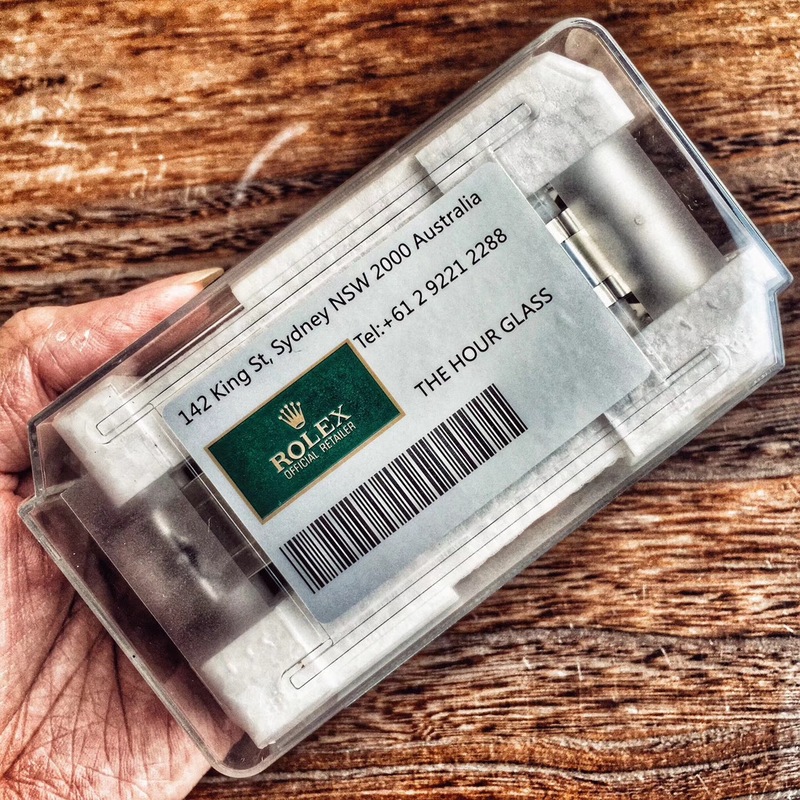 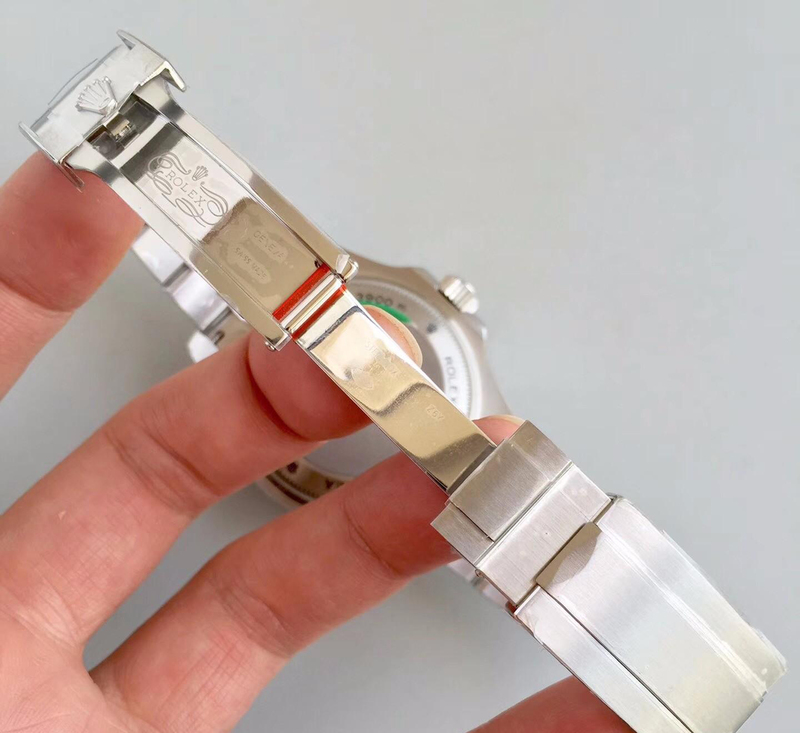 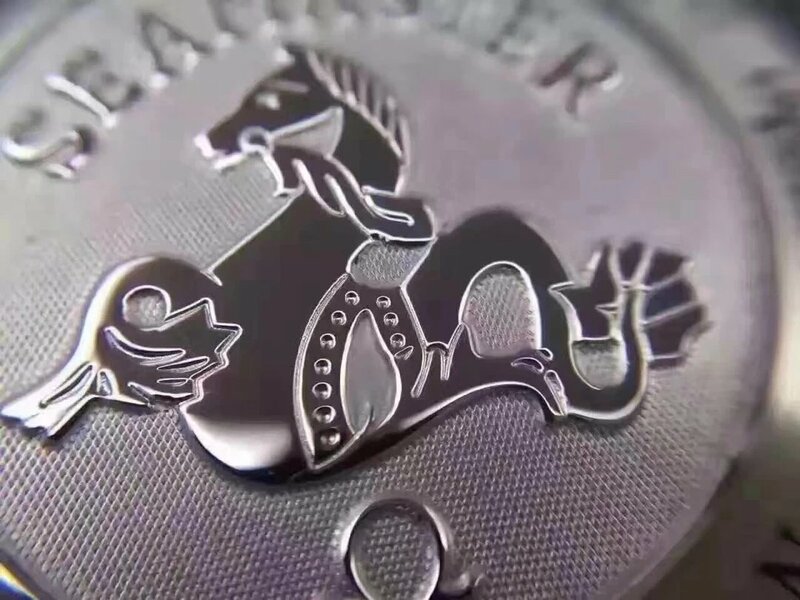 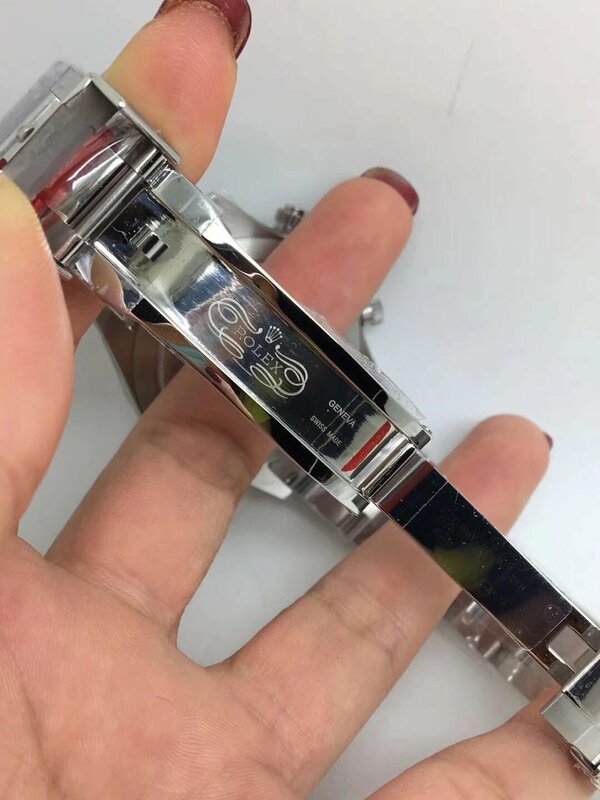 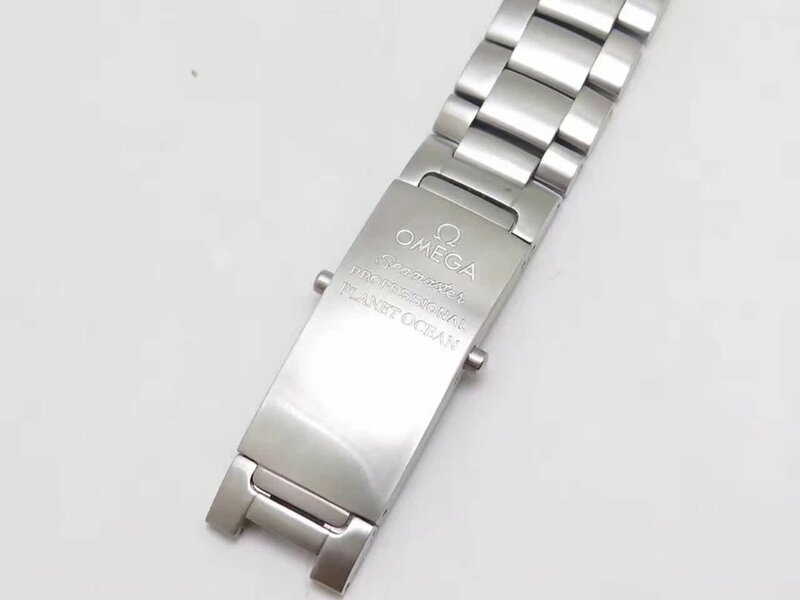 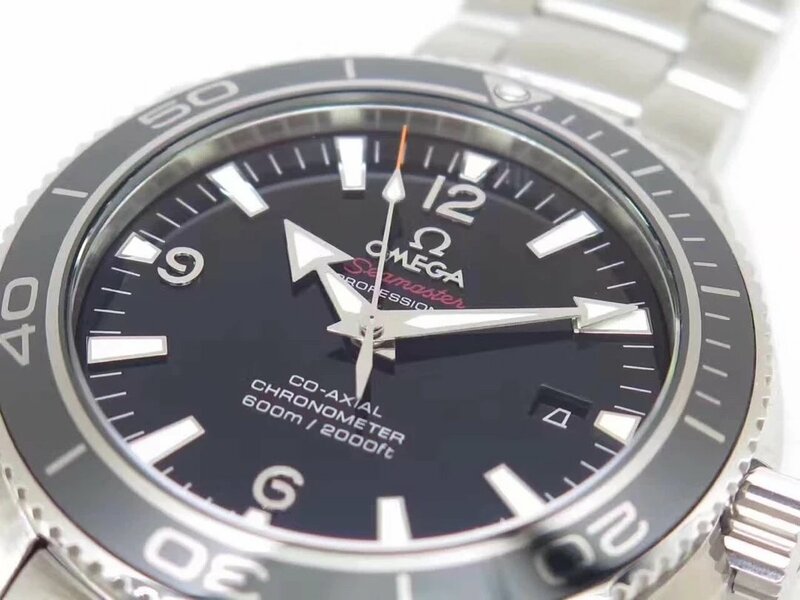 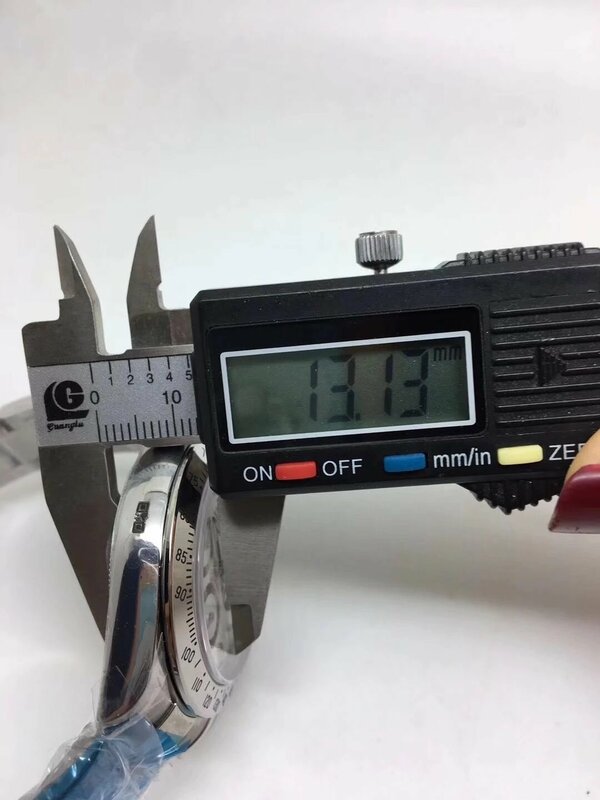 There is silver edge for each hour marker and hand, which looks more three-dimensional, round markers have the same size and arc degree as genuine watch, a small date window is positioned at 3 o’clock, date font is centered and has the same size and thickness as original. 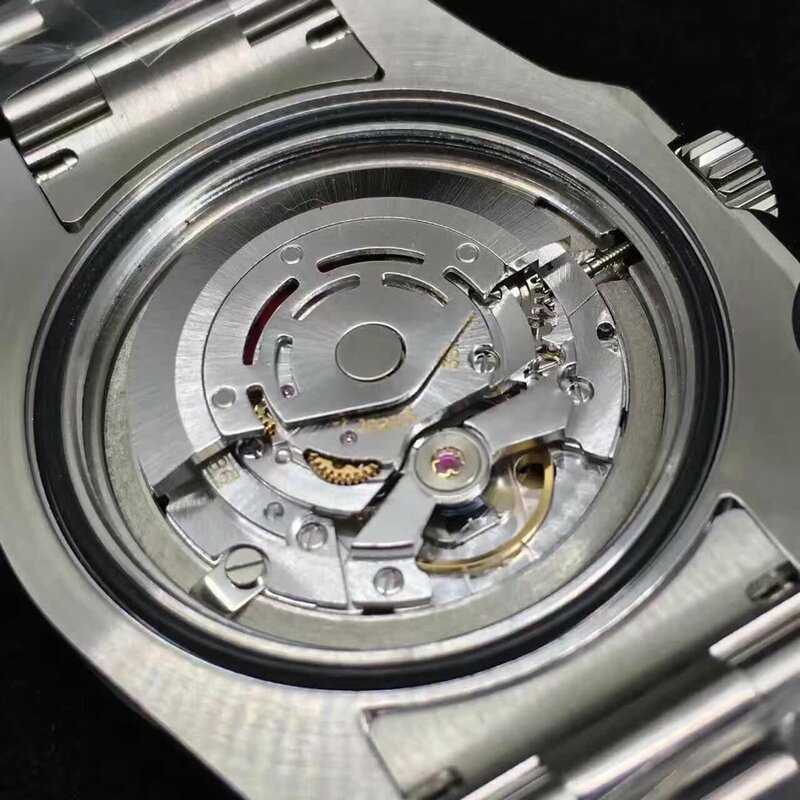 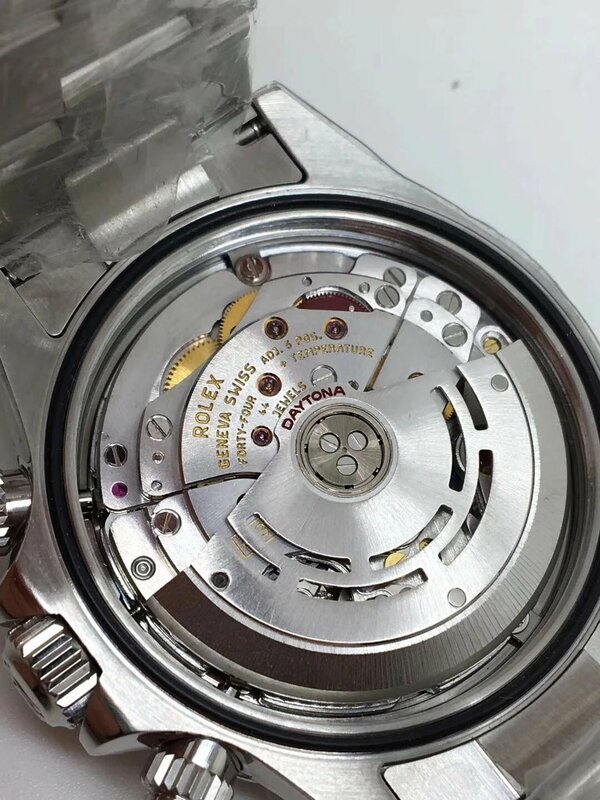 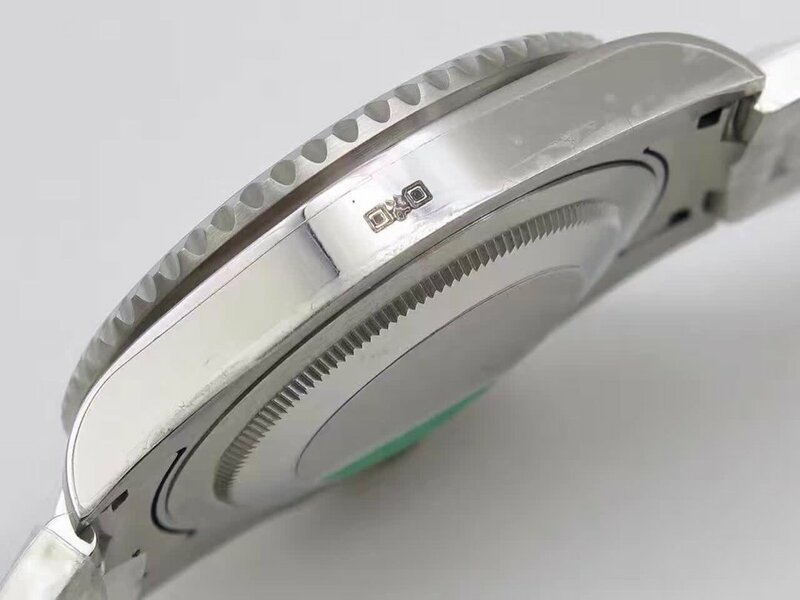 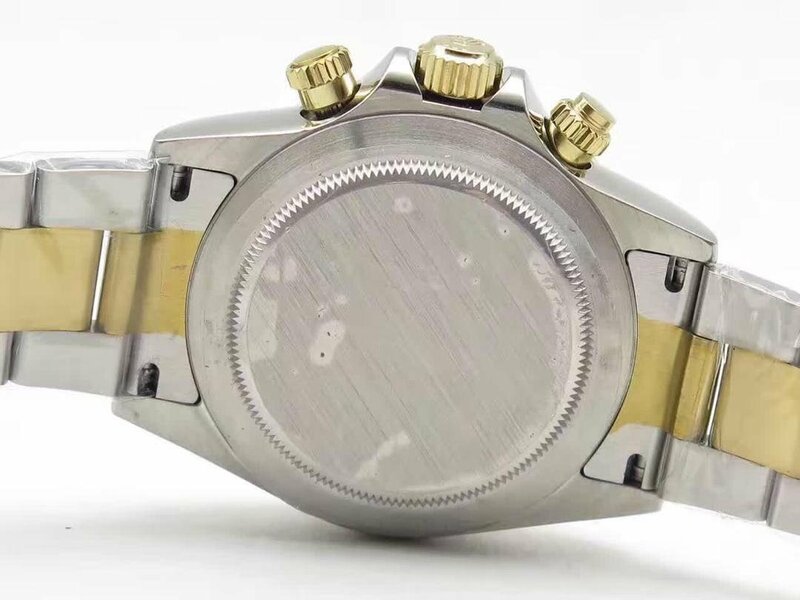 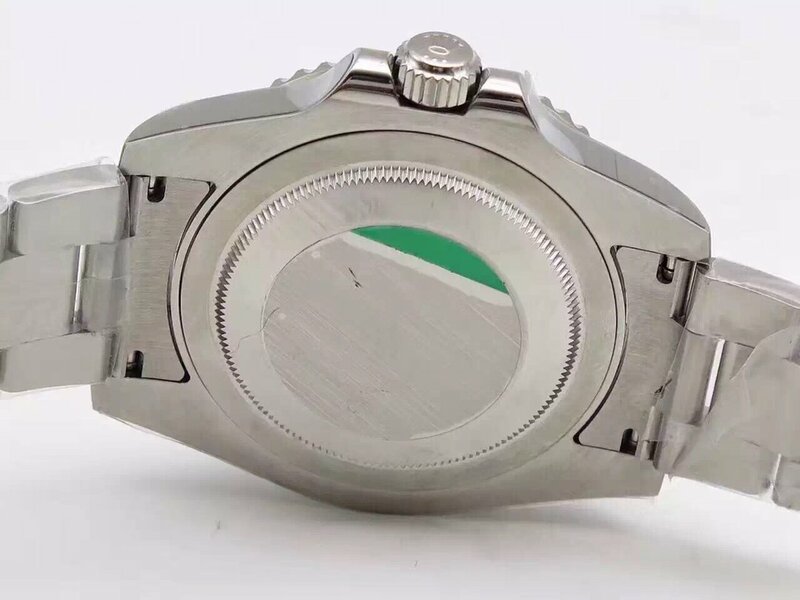 AR is the first factory to use 904L stainless steel on their replica Rolex, this time they also produce the replica 116660 with 904L steel, compared with 316L used on most replica watches, 904L stainless steel does better in corrosion resistance. 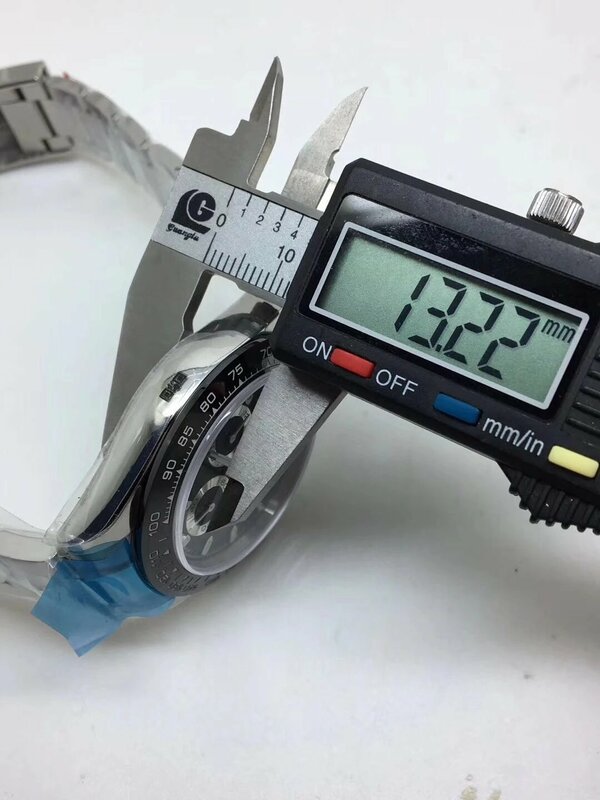 On its 44mm case, AR factory shows the super drawing process, case corner is polished round and smooth, you can feel no difference compared it with a genuine. 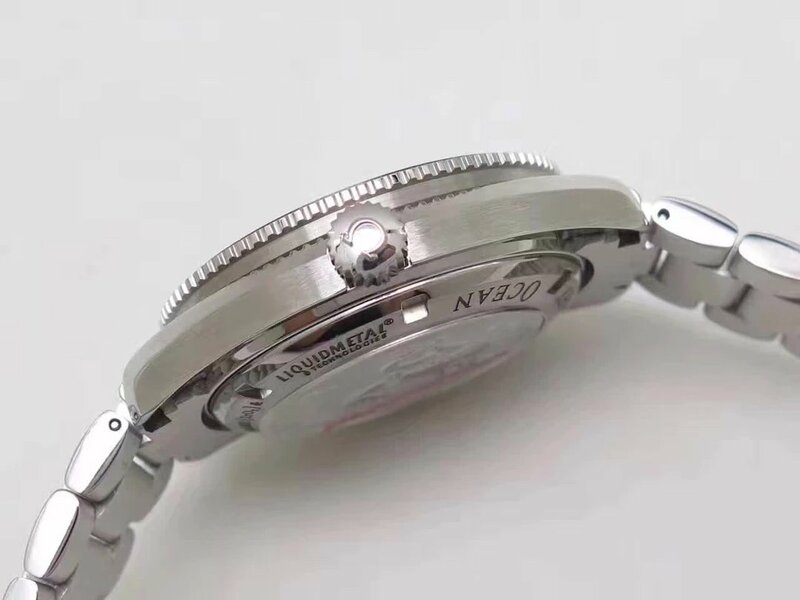 Case back is unique, the edge uses tooth design, black engravings will never fade, the most important thing is its round part on the center is brushed, this gives us a comfortable wearing feeling. 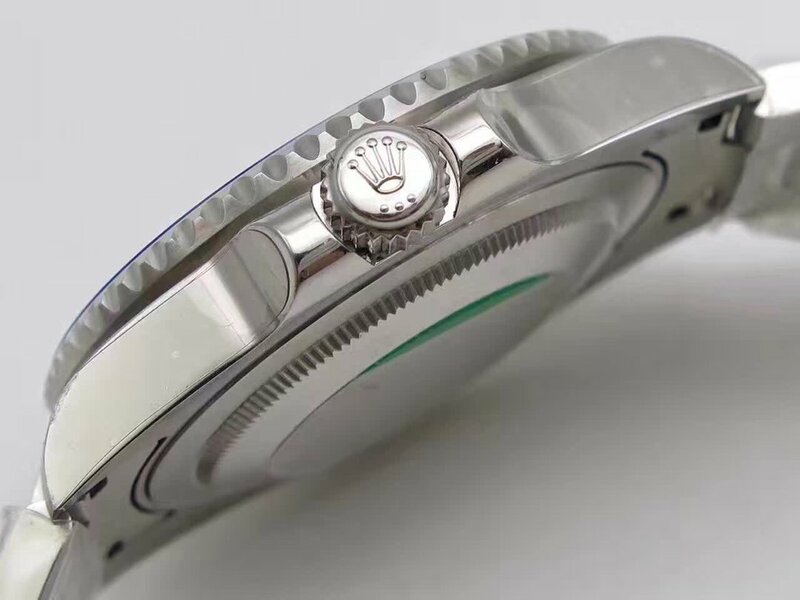 While the bezel is another part that is made better than Noob’s. 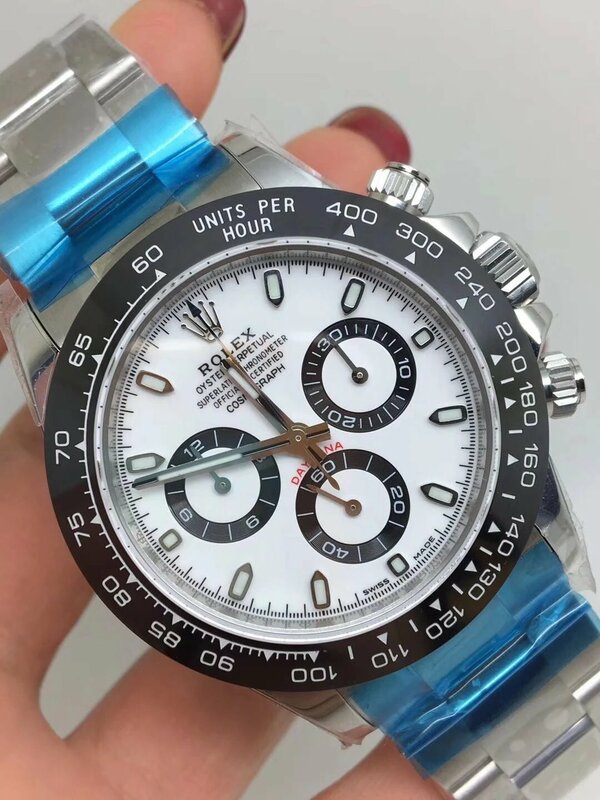 Black ceramic bezel insert features silver markers, which are in same tone as those bezel markers on genuine. 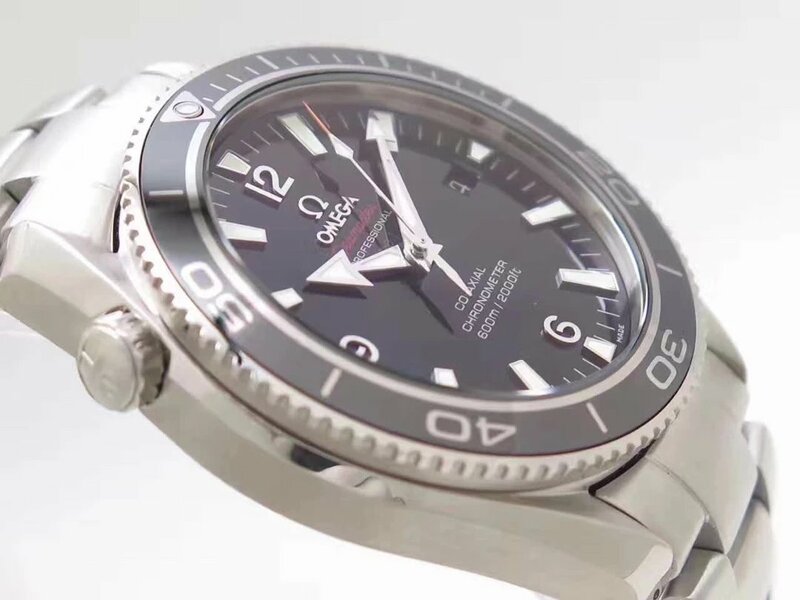 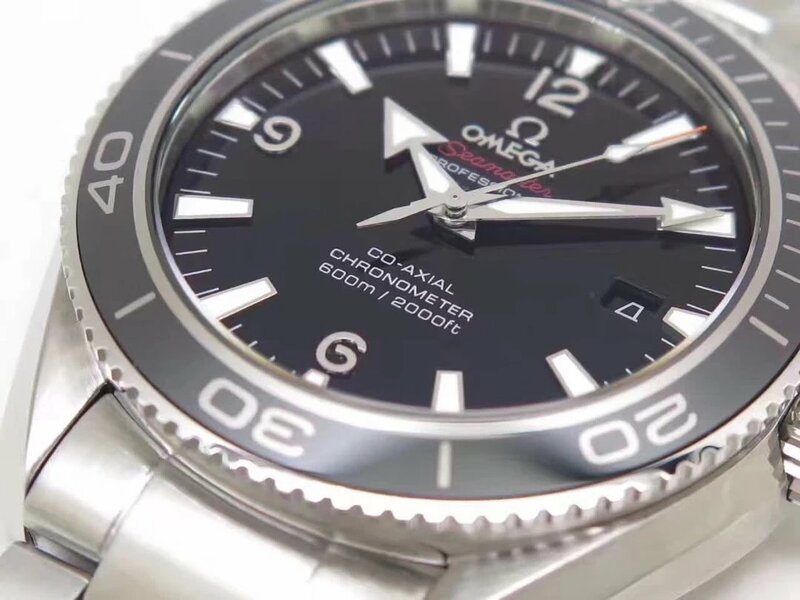 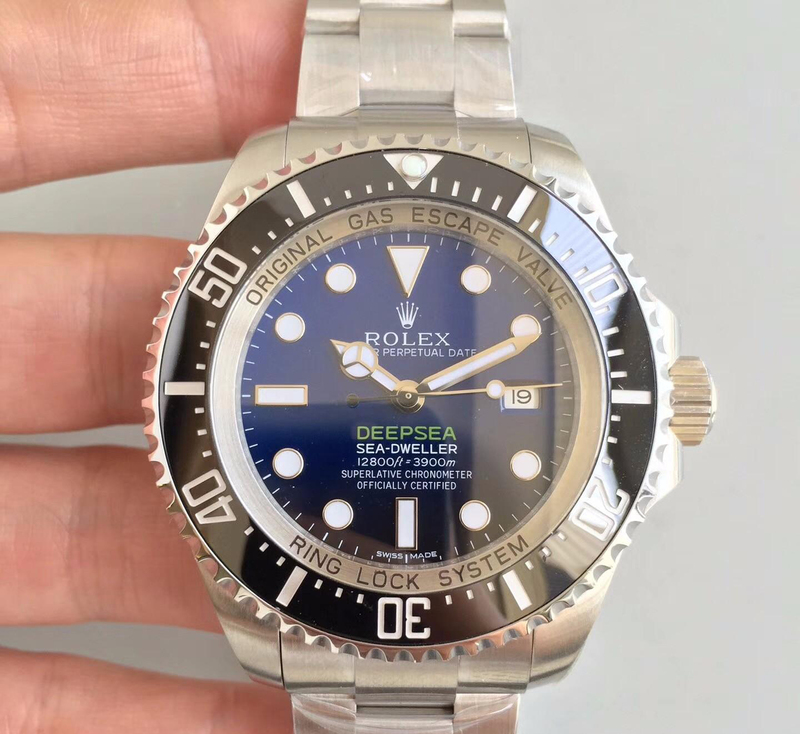 Bezel diving markers are also engraved in a correct depth, compared with other DEEPSEA D-Blue replicas from small factories, ARF really improved the bezel a lot. 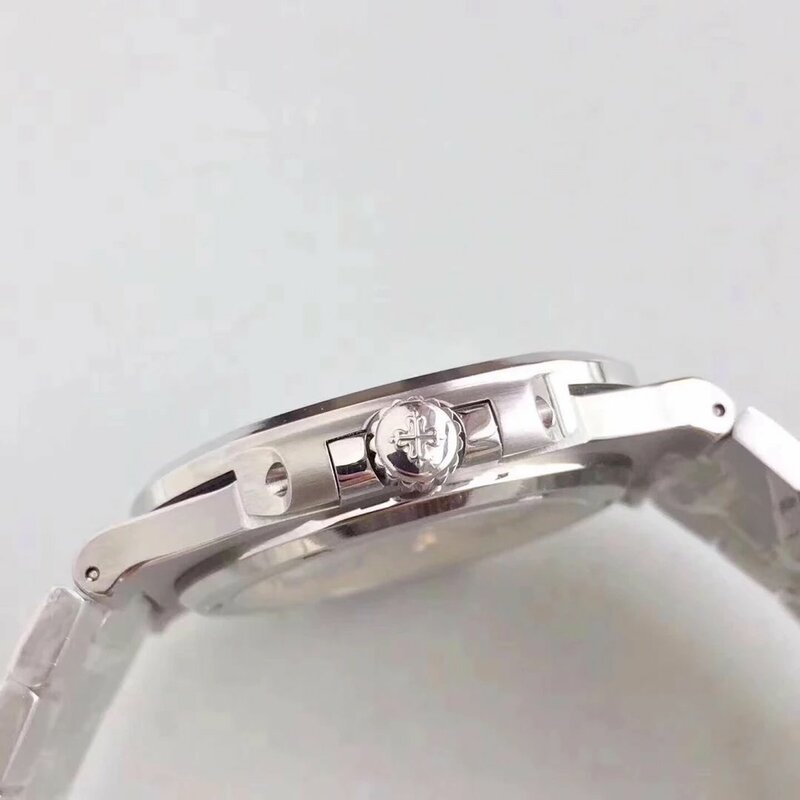 About the bezel pearl that is set on a big triangle mark, it looks plump but not very domed, this is closer to genuine bezel pearl. 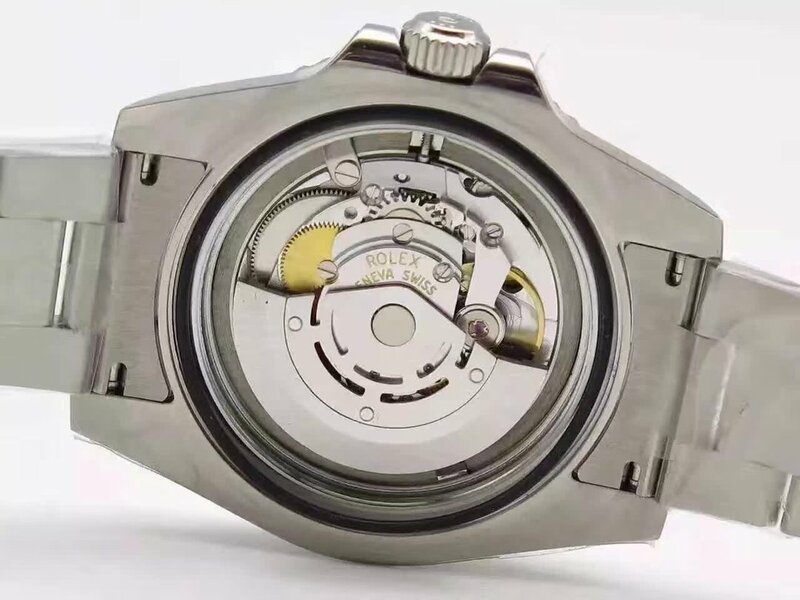 At last, the replica is equipped with a Swiss ETA 2824 automatic movement, it is a real ETA, not fake. 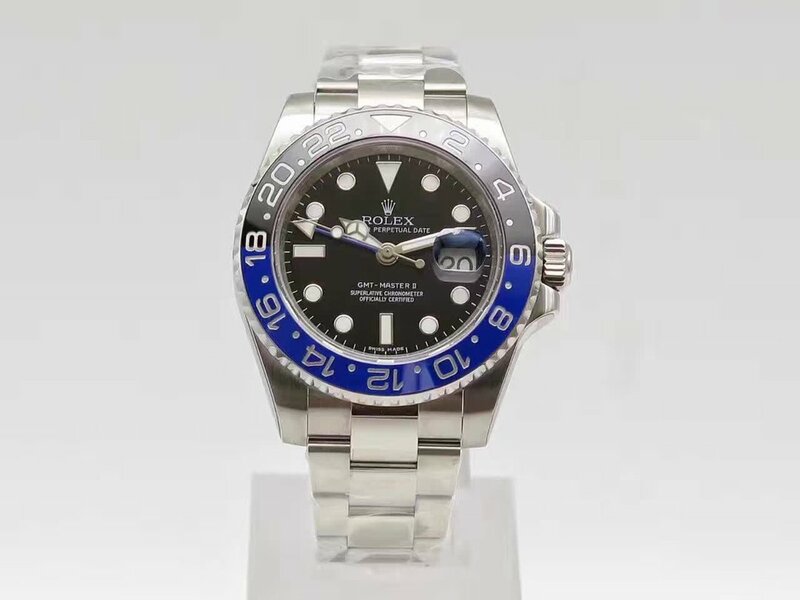 So the price of this replica will be a little high. 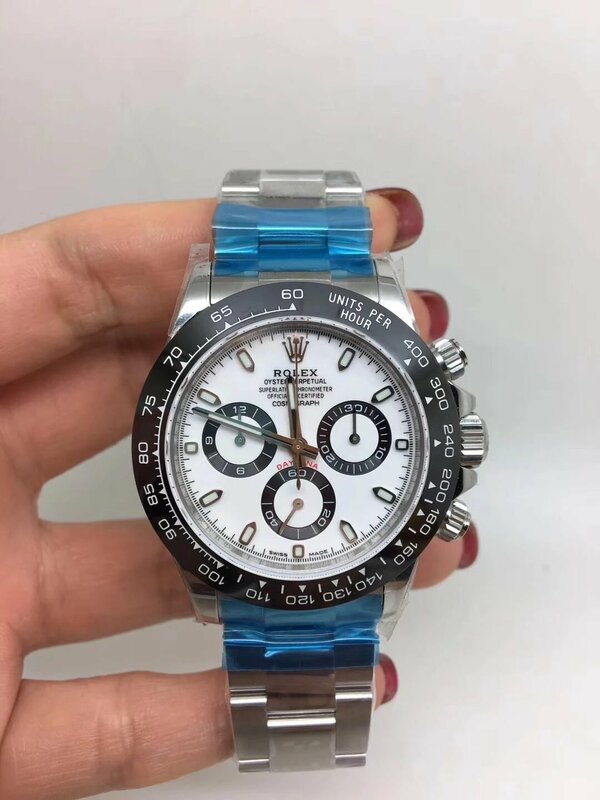 Not like the replica from Noob with an Asian ETA or Super Copy 3135. 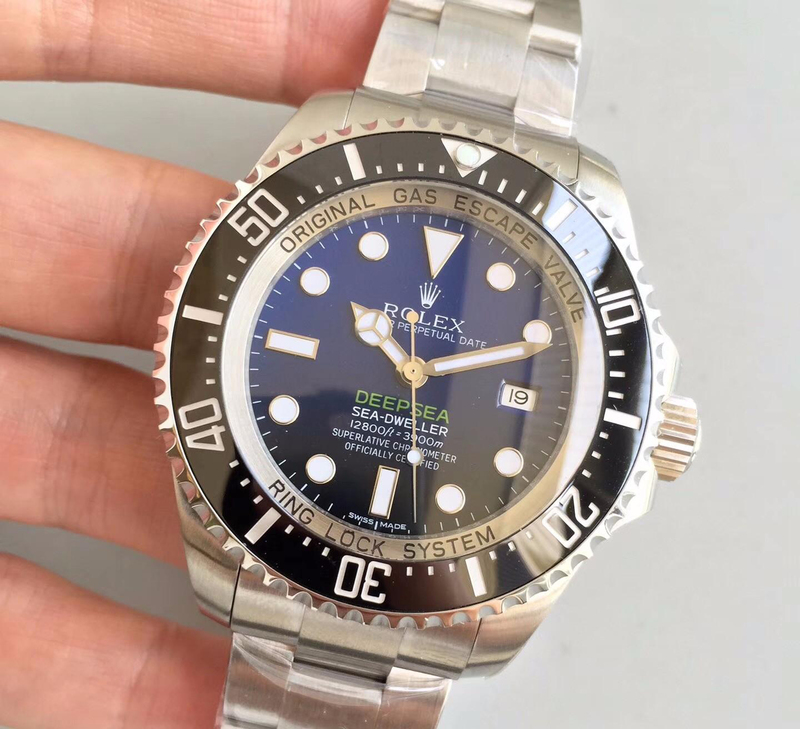 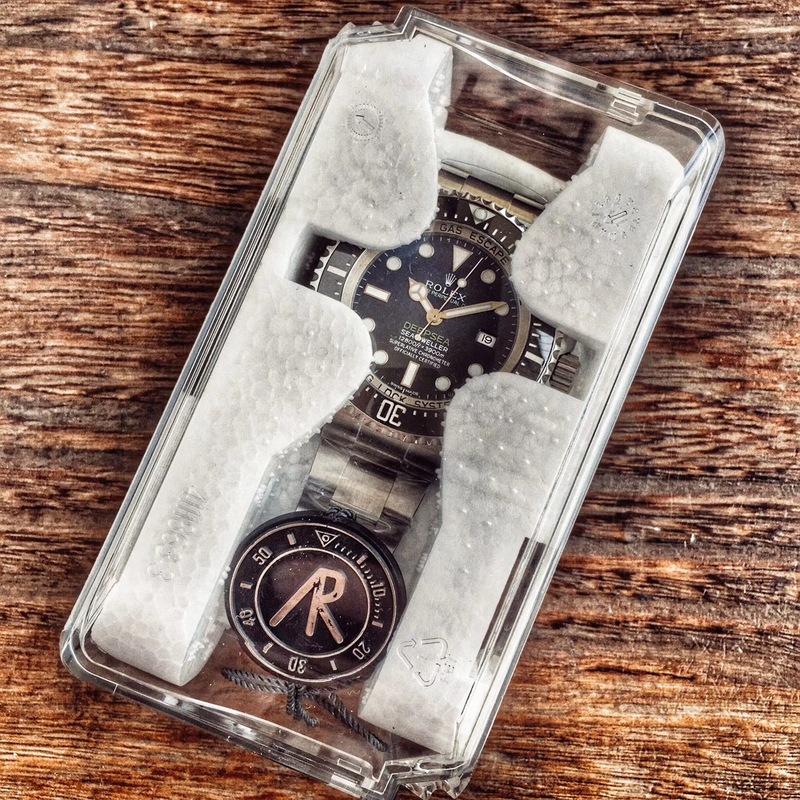 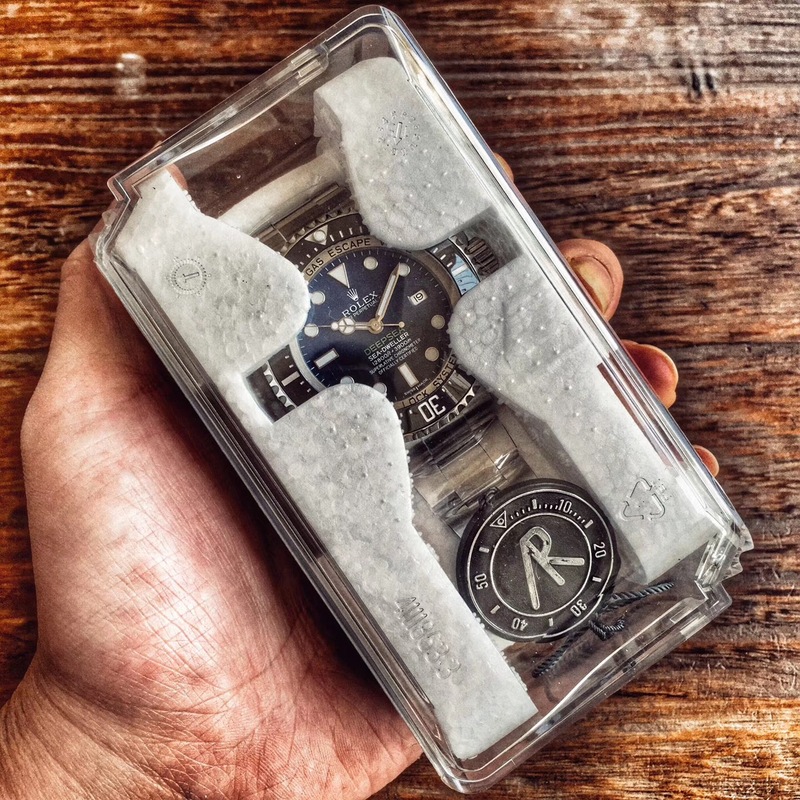 So, this is the overall review of the latest replica Rolex DEEPSEA D-Blue 116660 from AR factory.